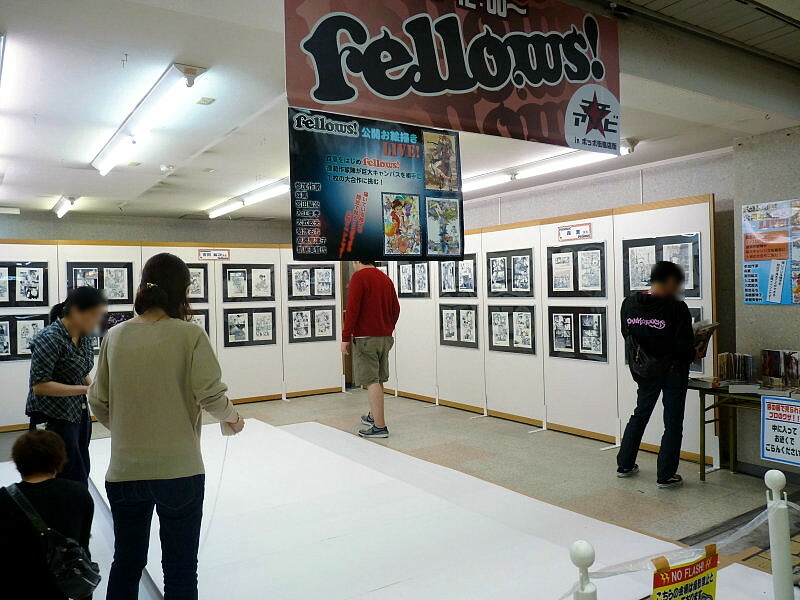 Last Sunday we were fortunate enough to witness seven talented manga artists from Enterbrain's bimonthly magazine Fellows! 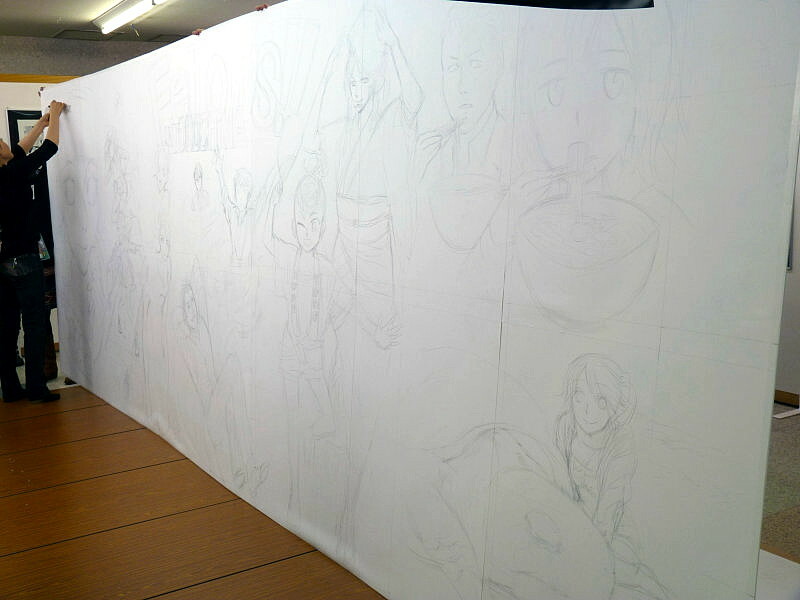 creating a beautiful mural for Machi★Asobi Vol.4, an anime-related festival held in Tokushima. 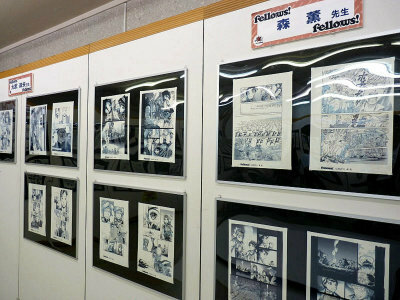 Although the seven artists must be relatively unknown outside Japan, except for Kaoru Mori of Emma maybe, they are all brilliant artists and you could clearly see why they get to do what they love for a living. 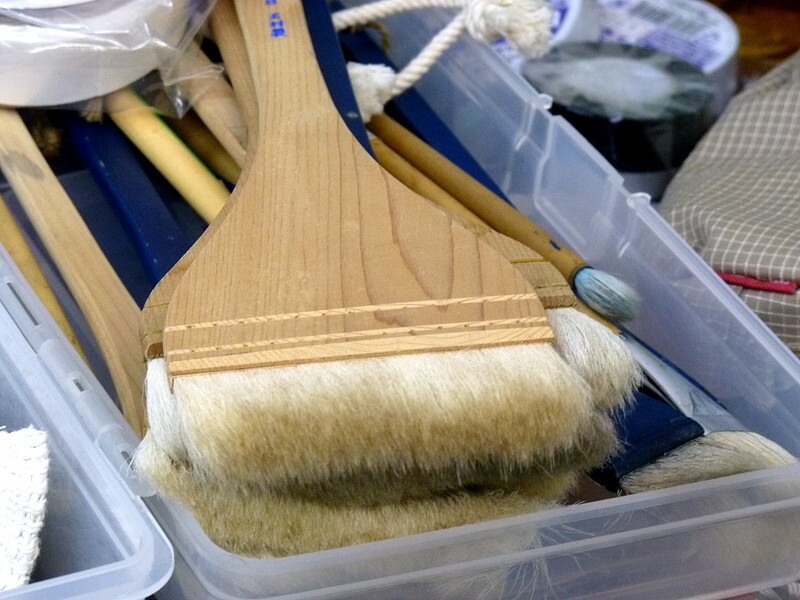 It's always great to see people doing what they're good at! Pics and videos after the cut! 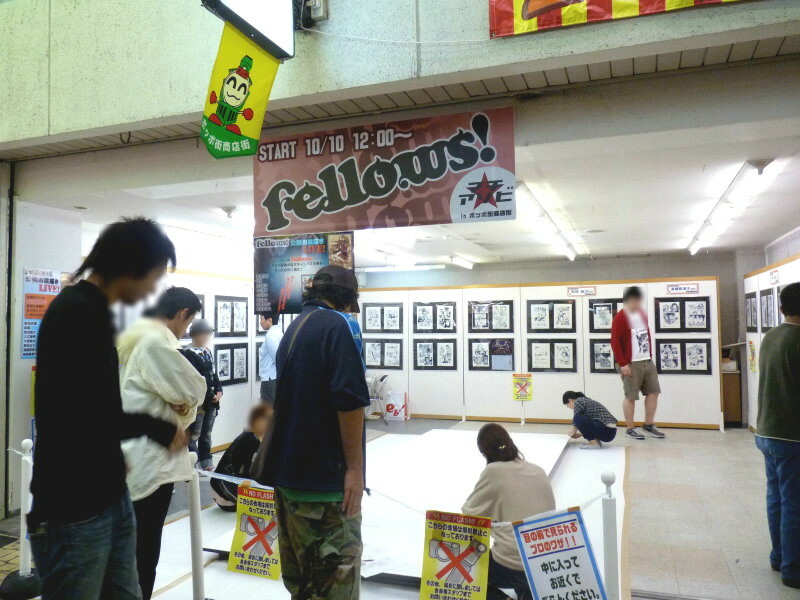 The event took place at an open gallery set for the occasion on a roofed shopping street in central Tokushima. 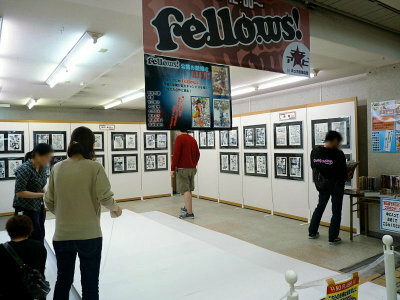 Works of the seven artists were on display. Good Afternoon Teatime by Michiyo Nii. 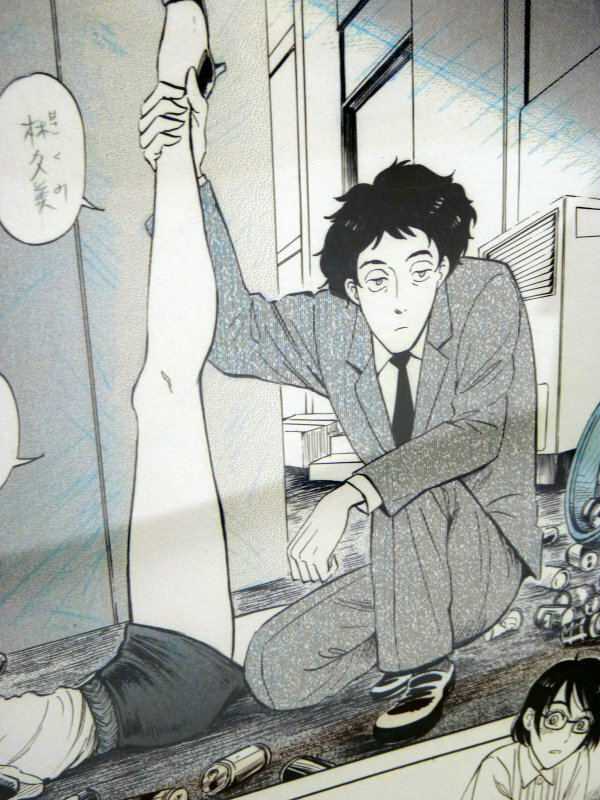 From Tantei Leg(Detective Leg), also by Michiyo Nii. 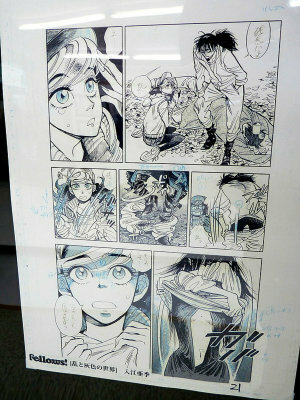 Lan to Haiiro no Sekai (Lan and the Grey World) by Aki Irie. 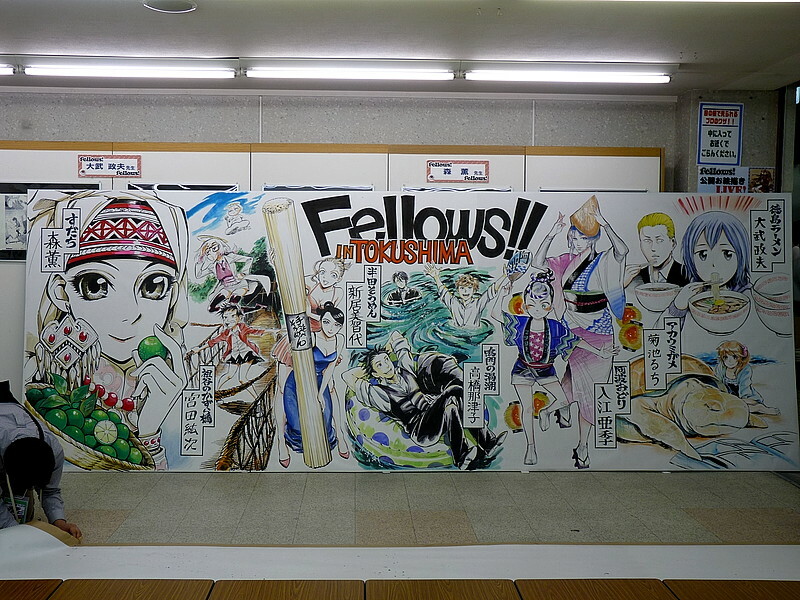 Fellows! 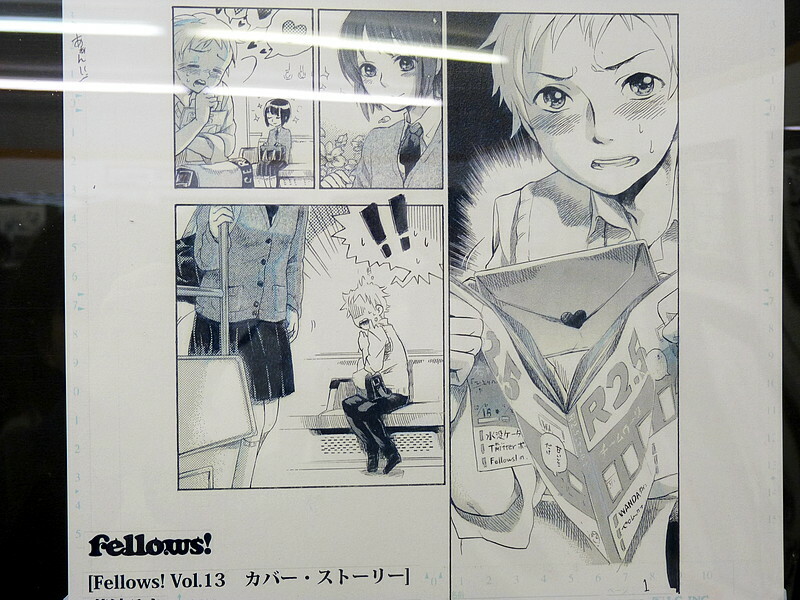 Vol.13 Cover Story by Ruchi Kikuchi. 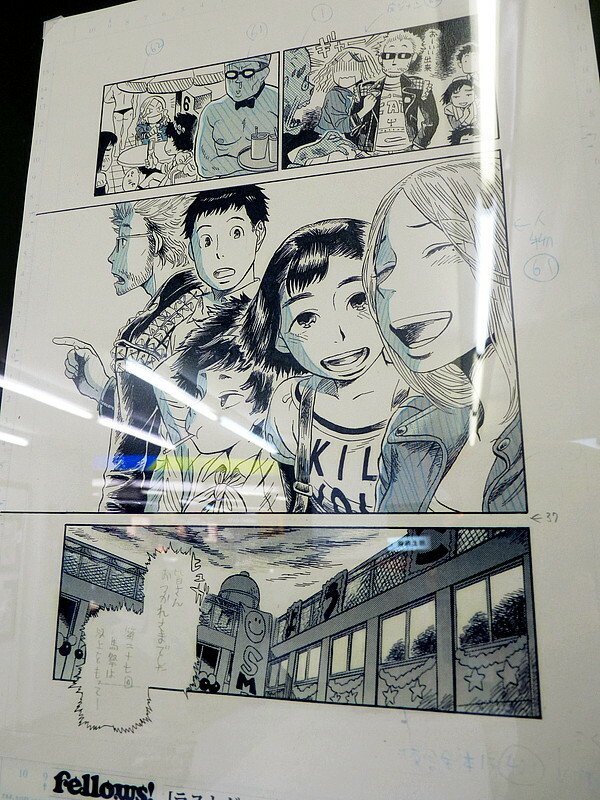 Last Dance wa Odoriba de (Let's have our last dance at the landing) by Koji Miyata. 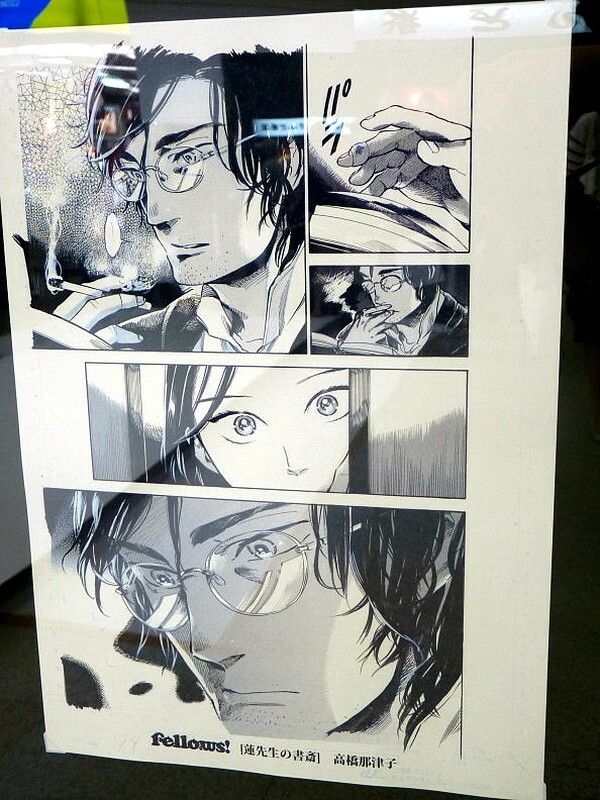 Ren Sensei no Shosai (Study room of Ren sensei) by Natsuko Takahashi. 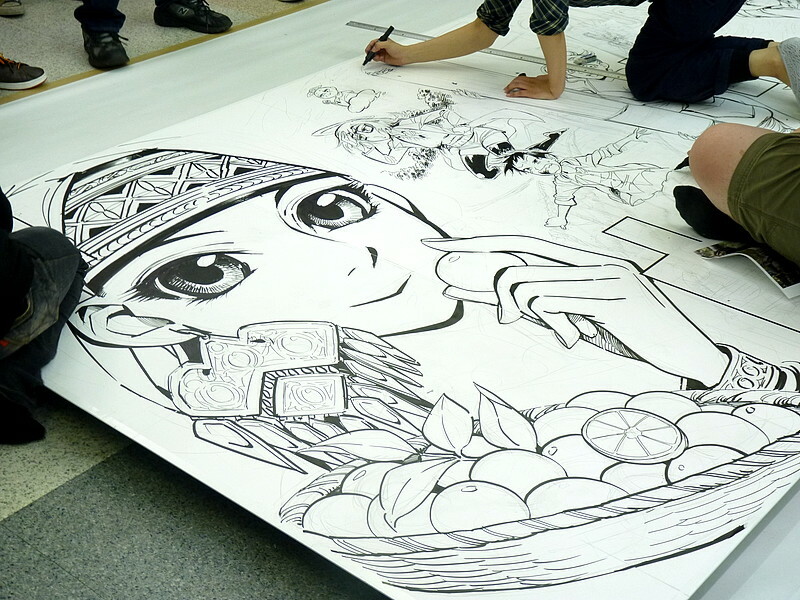 Hina Matsuri(Hina Festival) by Masao Otake. 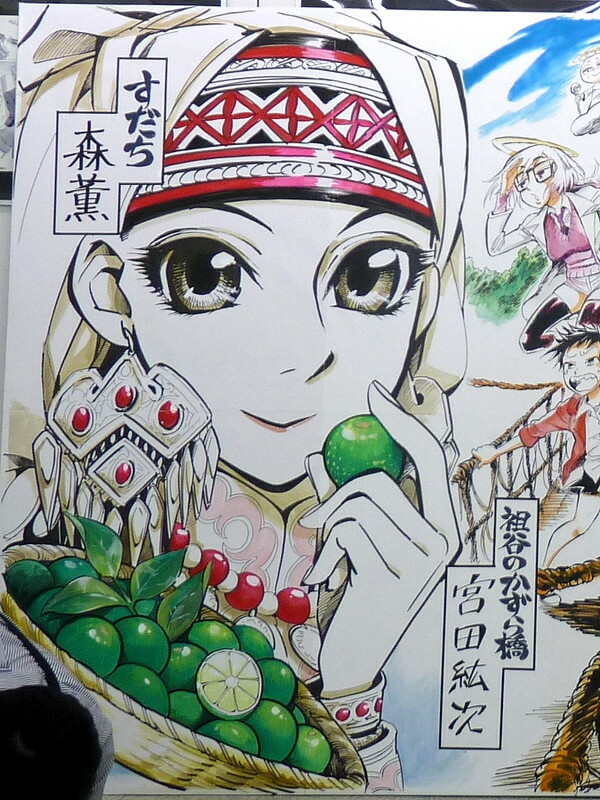 Otoyomegatari(The Bride's Stories) by Kaoru Mori. You could read the manga while waiting. 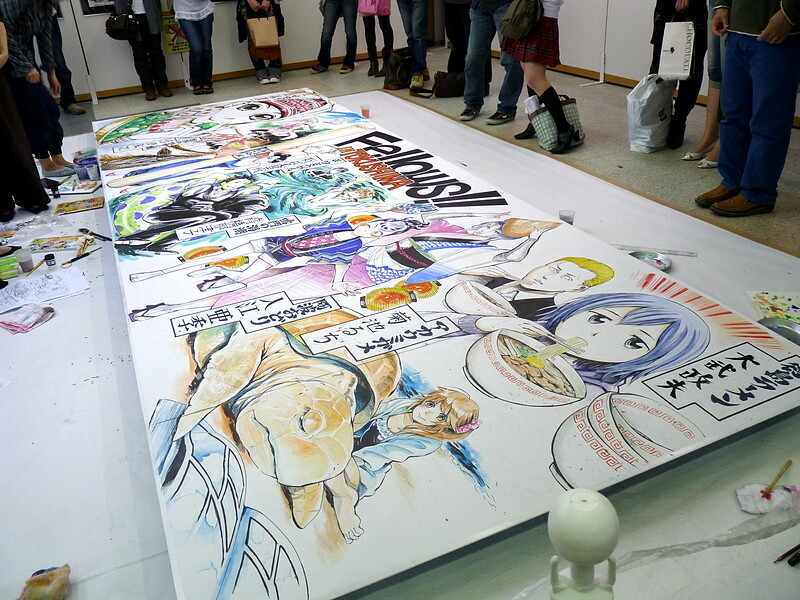 The live painting started around noon. 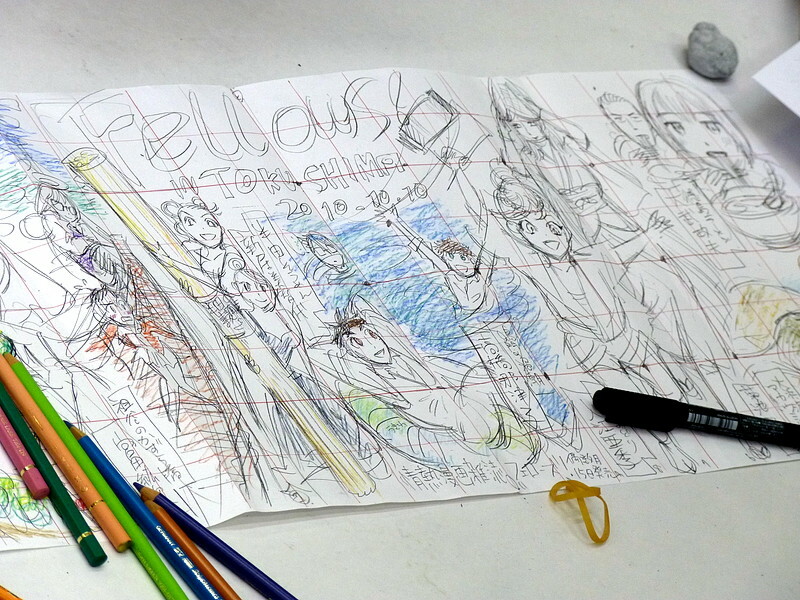 Here's the rough sketch of the mural. 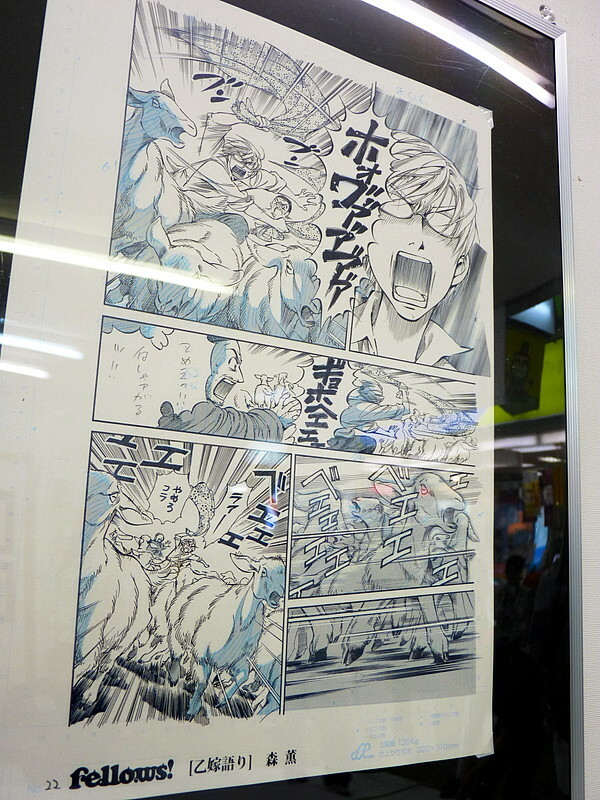 Each artist has a Tokushima-related theme: "Sudachi" for Kaoru Mori. 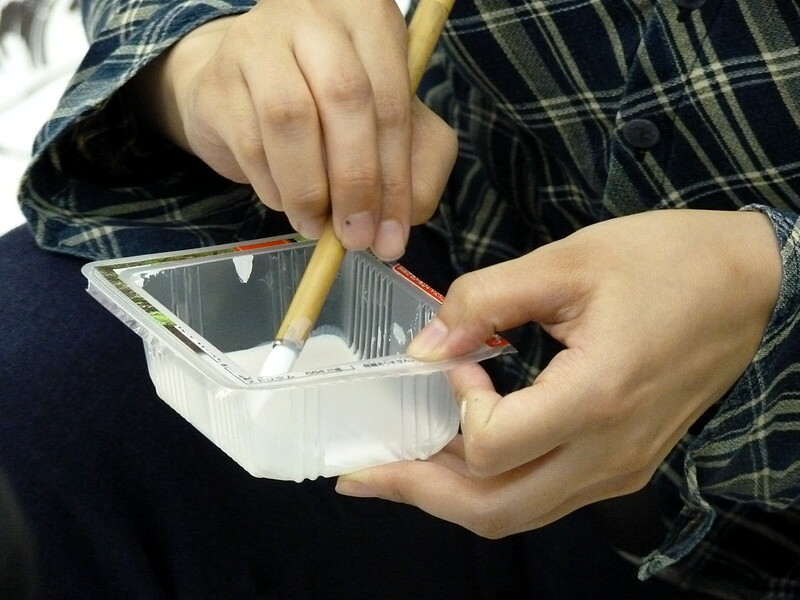 "Handa Somen" for Michiyo Nii. 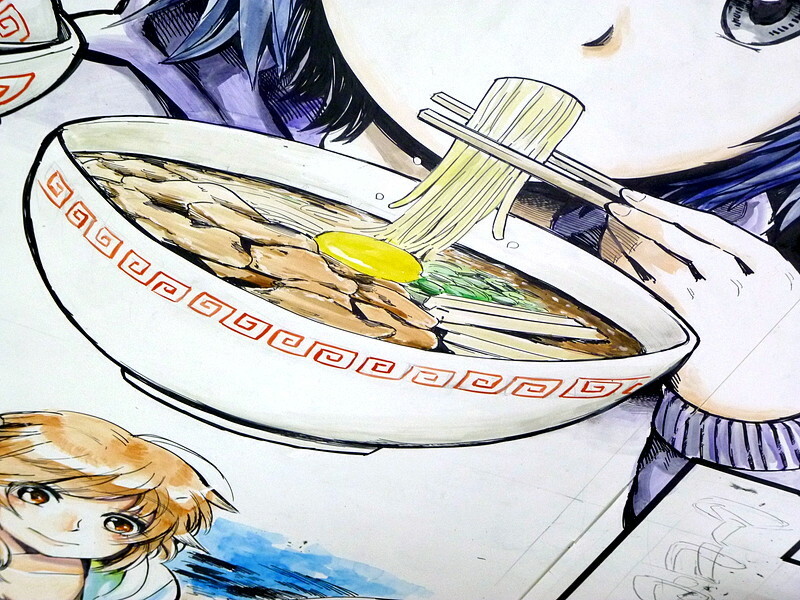 Masao Otake takes a shot at "Tokushima Ramen" and Ruchi Kikuchi at "Loggerhead sea turtle". 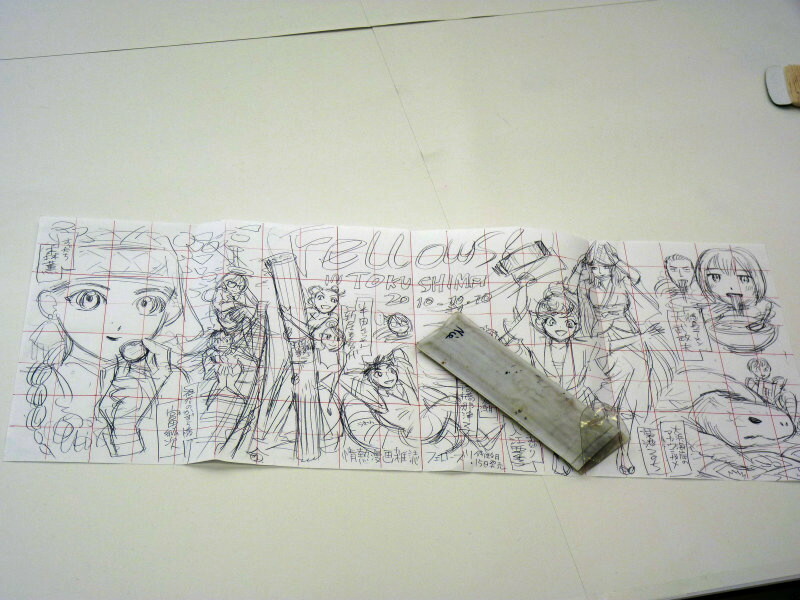 First they draw grid lines to enlarge the sketches. 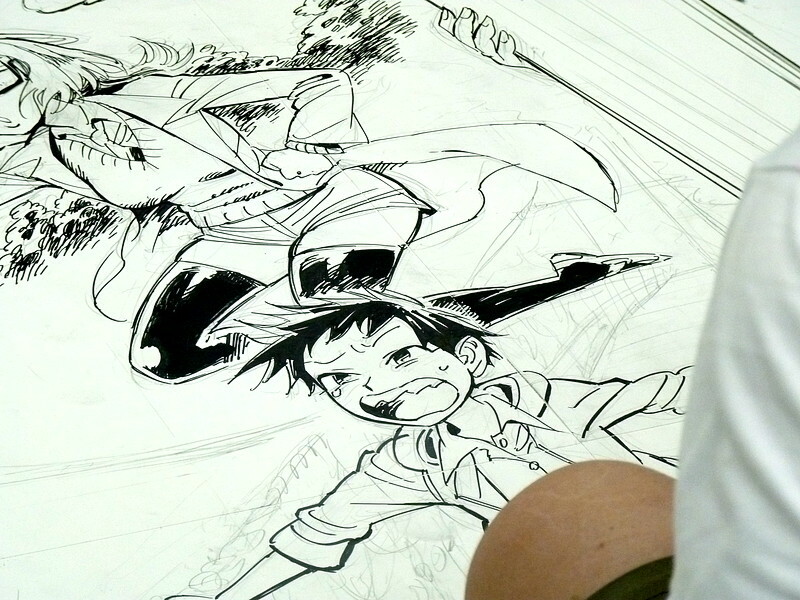 Then the underdrawing process started. 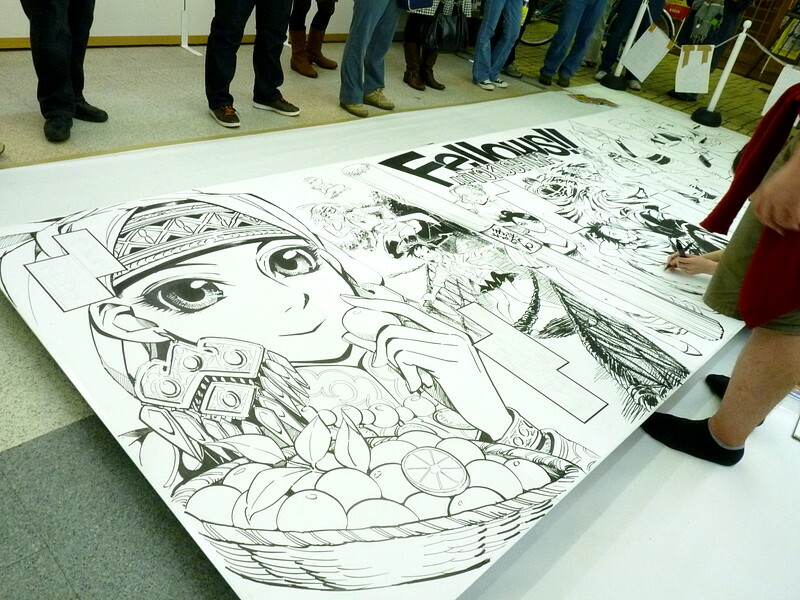 Here's a video of Kaoru Mori drawing Amira Hergal, heroine of her ongoing manga Otoyomegatari. Here she swiftly draws Amira's mouth and nose. 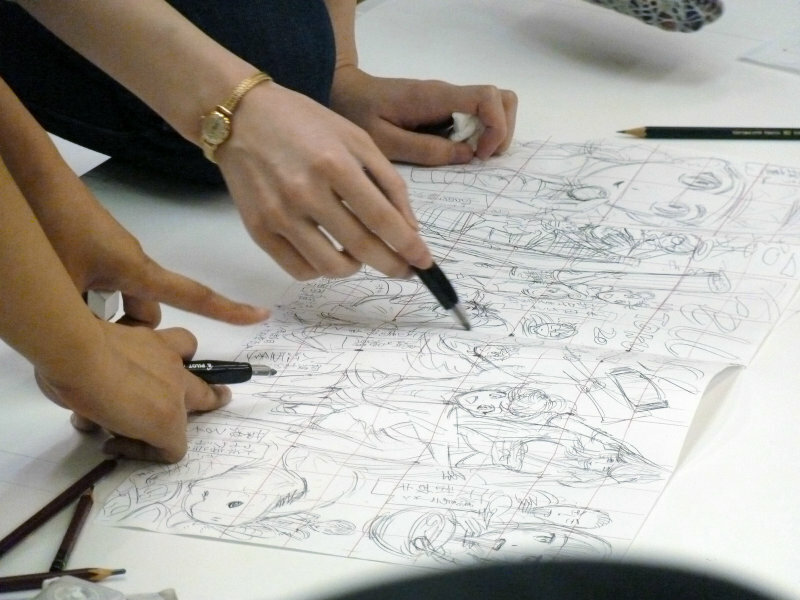 Natsuko Takahashi and Masao Otake discussing details. 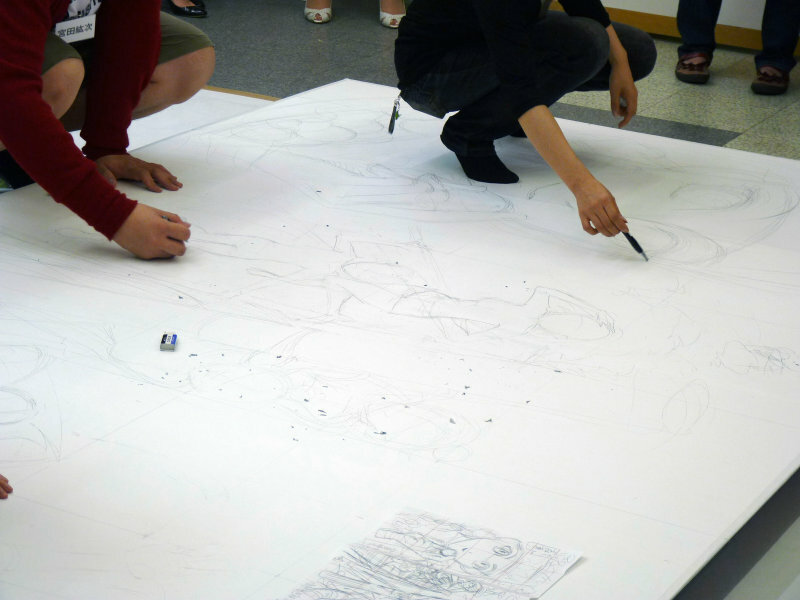 The video below shows Masao Otake and Aki Irie at work. 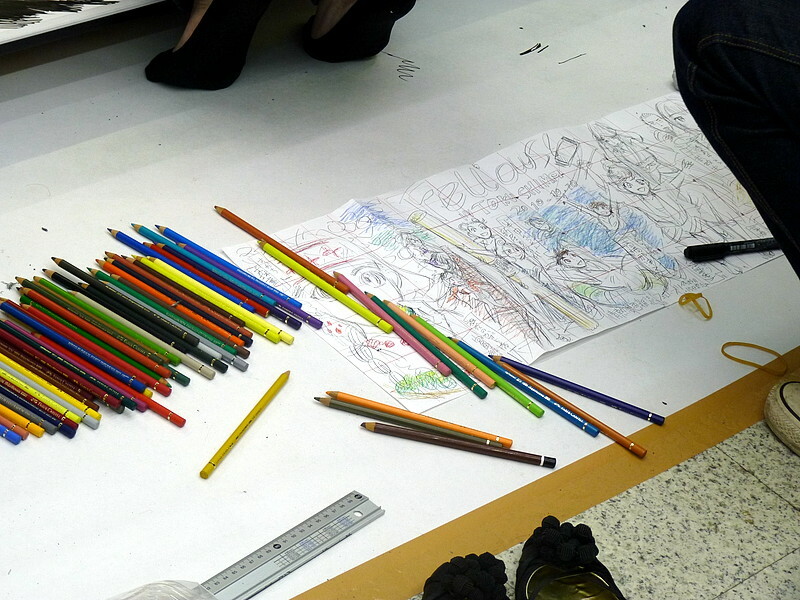 They were using Pilot Croquis sketching and drawing pencil. 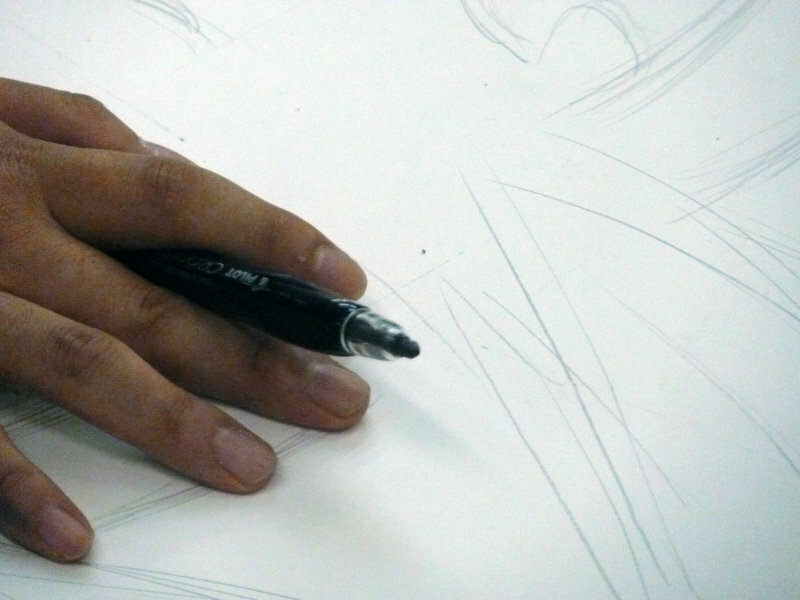 And Tombow MONO plastic eraser. 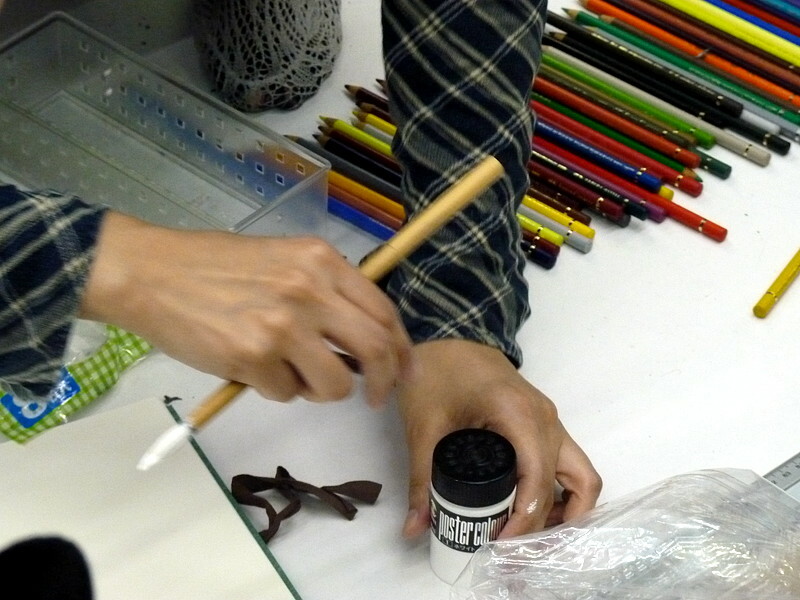 Here's Natsuko Takahashi at work. 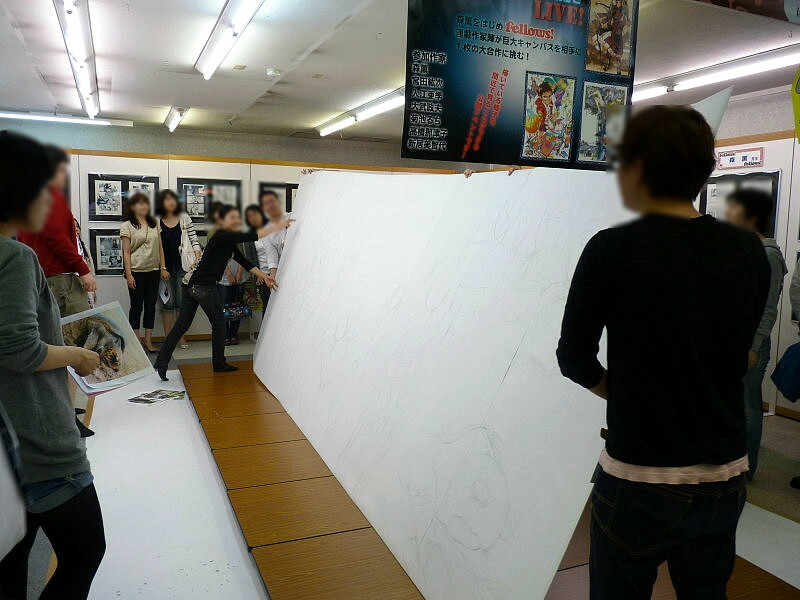 Kaoru Mori and Koji Miyata working on their part. 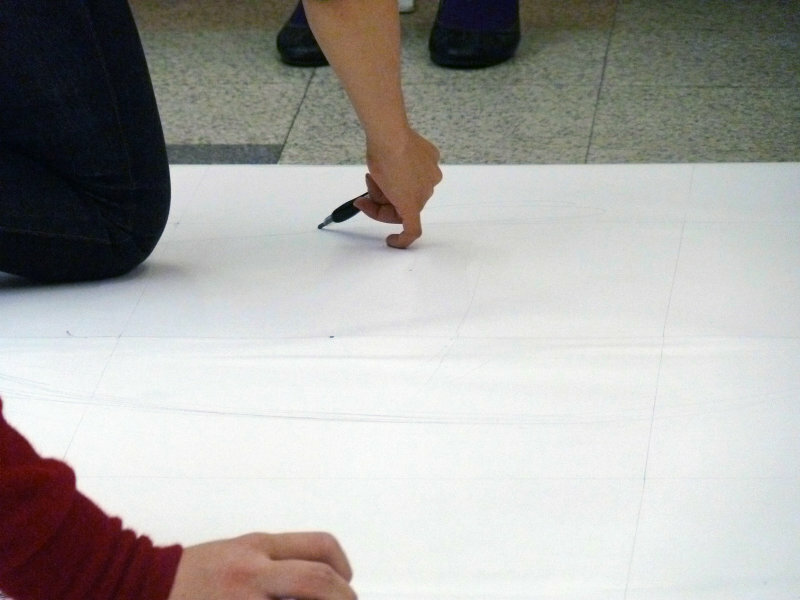 Drawing the outline with sharpie. 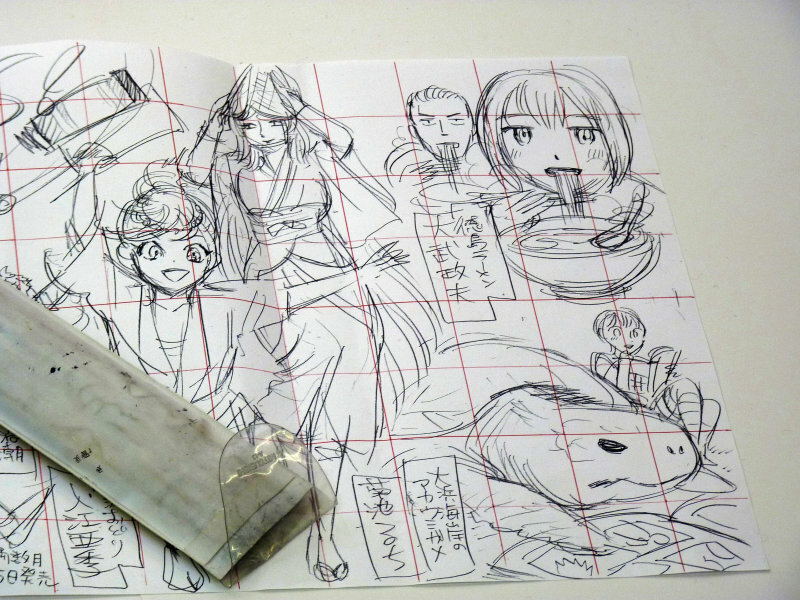 Michiyo Nii drawing a bundle of dried somen noodles. 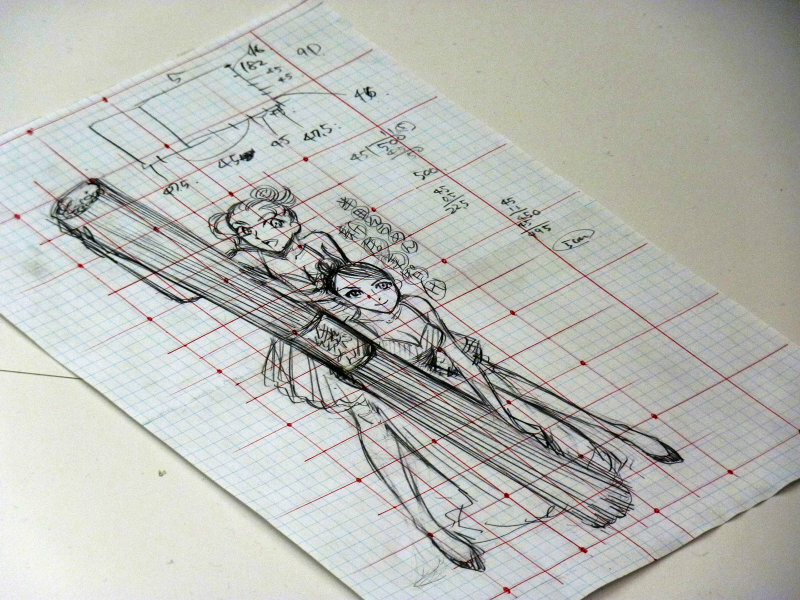 Here she uses a ruler. 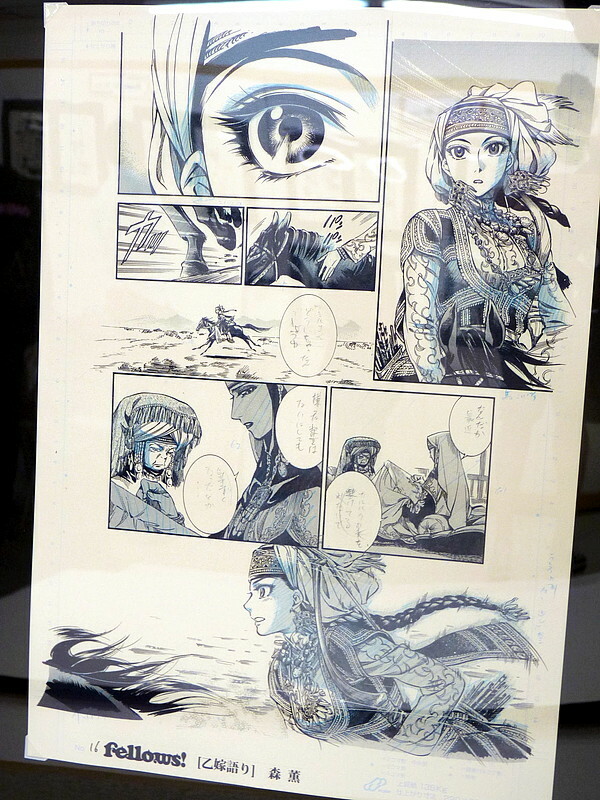 This part is illustrated by Koji Miyata. 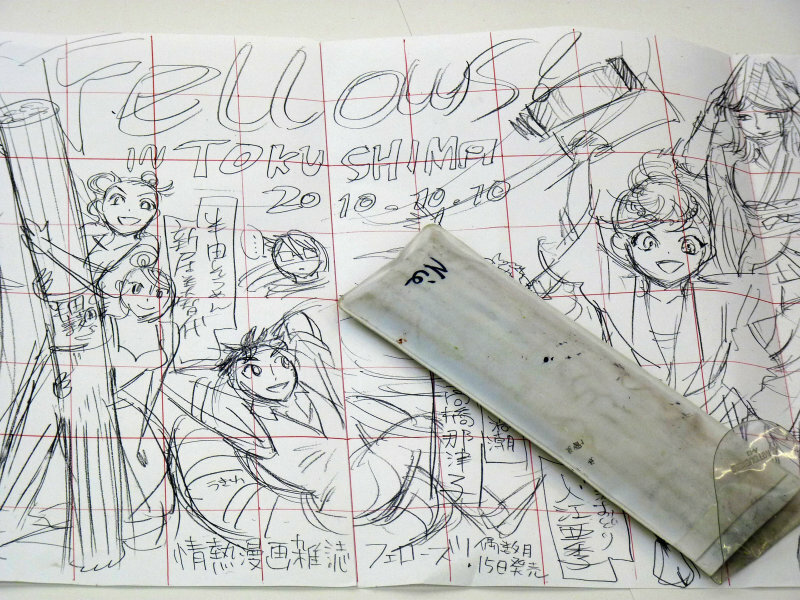 The following video shows Kaoru Mori, Koji Miyata and Michiyo Nii at work. 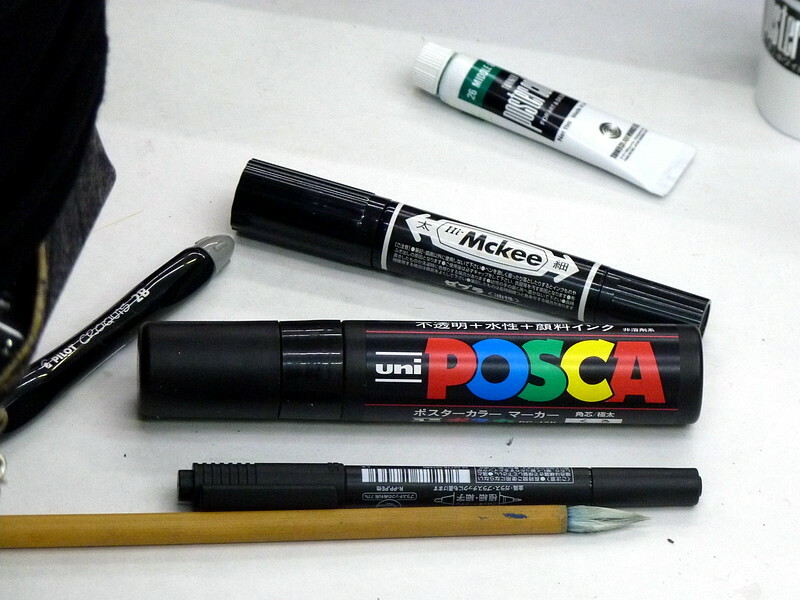 They were using various black markers including Uni POSCA Markers and Zebra Hi-Mckee Oil Based Marker. 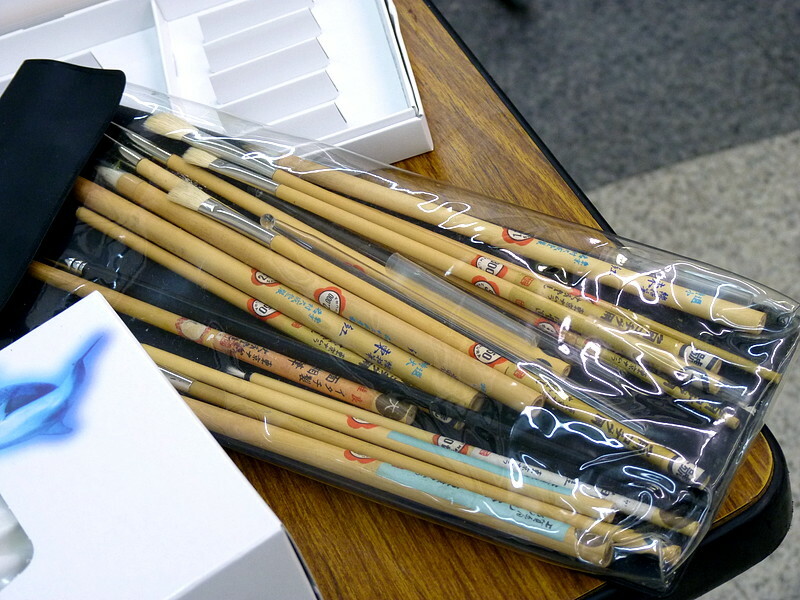 These coloured pencils they used to discuss colour scheme. 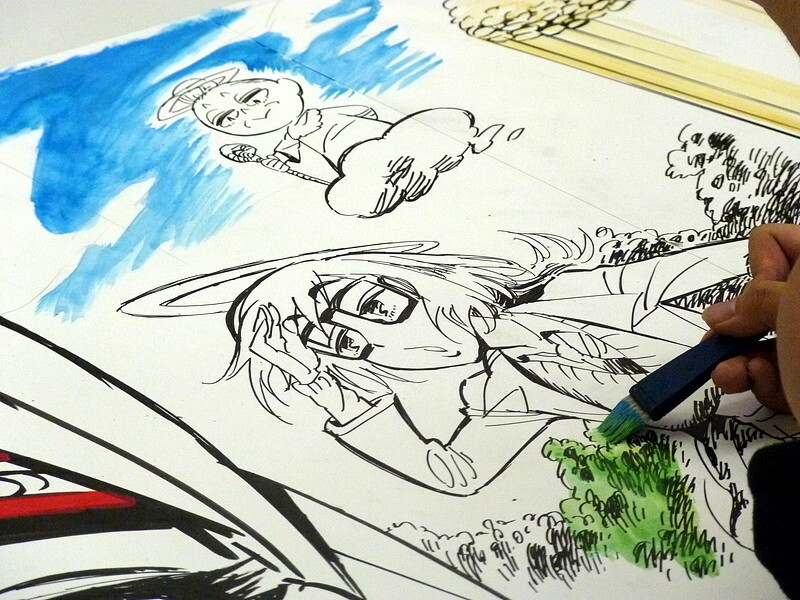 Almost done with the pens. 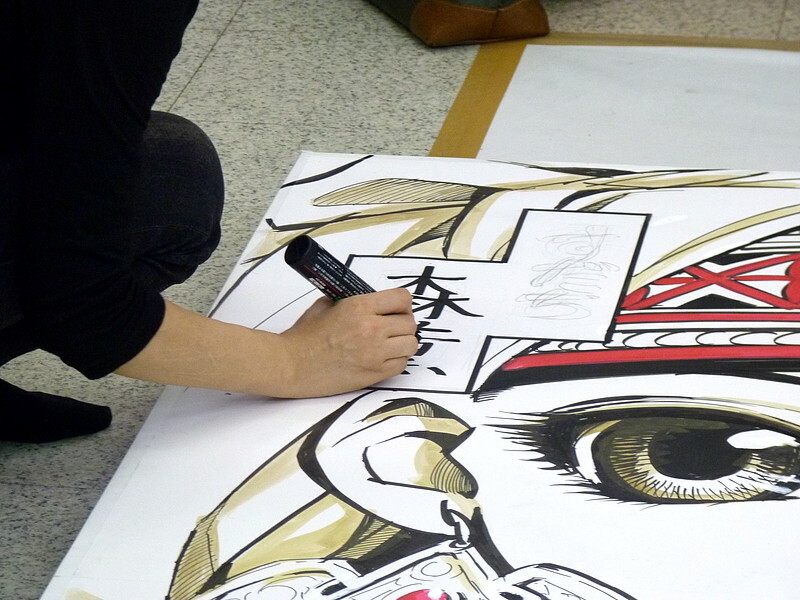 Michiyo Nii applies white Turner Poster Colour for touch-up. 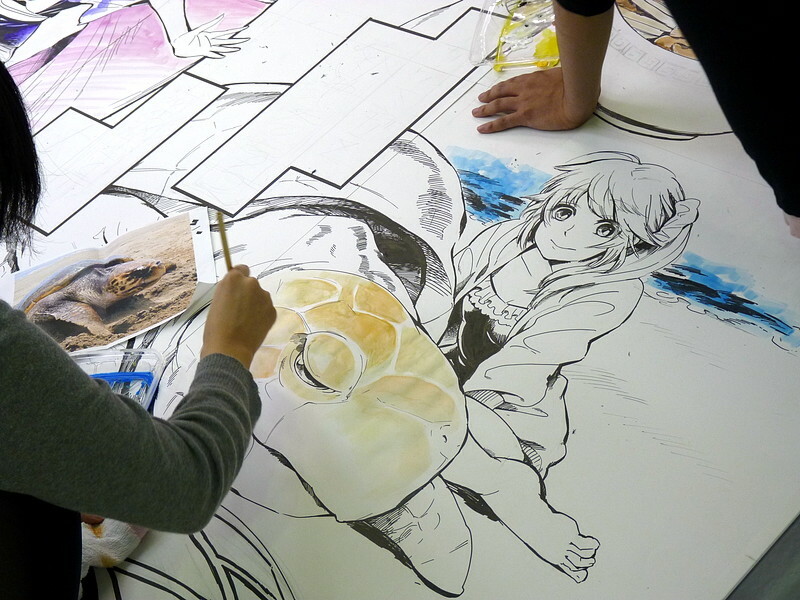 Ruchi Kikuchi colouring a turtle. 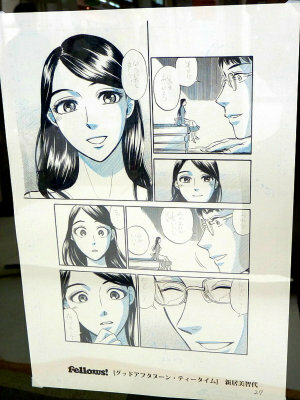 Here she delicately colours its eyelid. 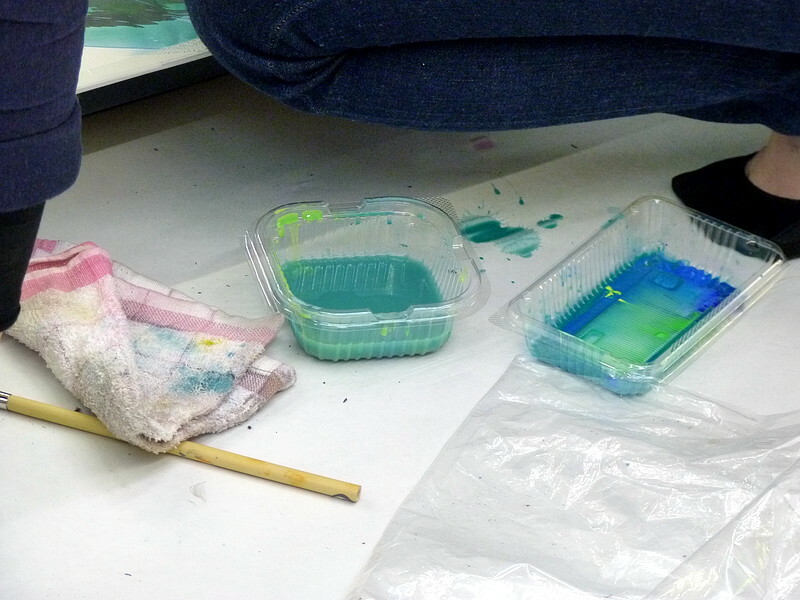 They also used plastic trays like these to wash and mix colours. 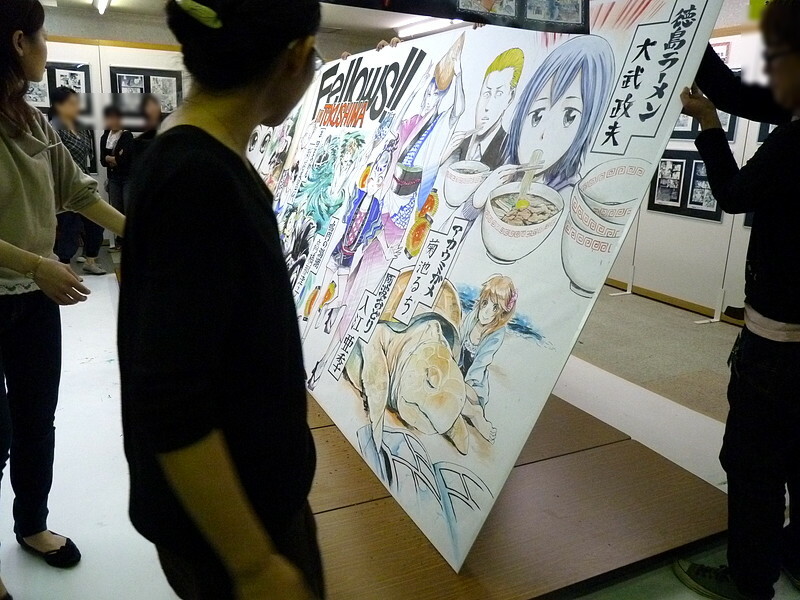 Masao Otake colouring a blonde guy's hair. 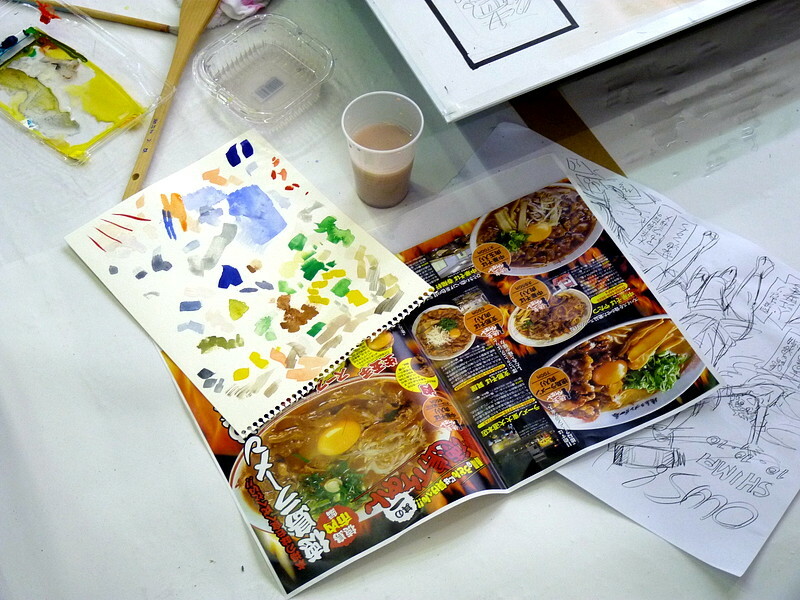 He painted the ramen consulting pictures in a magazine. 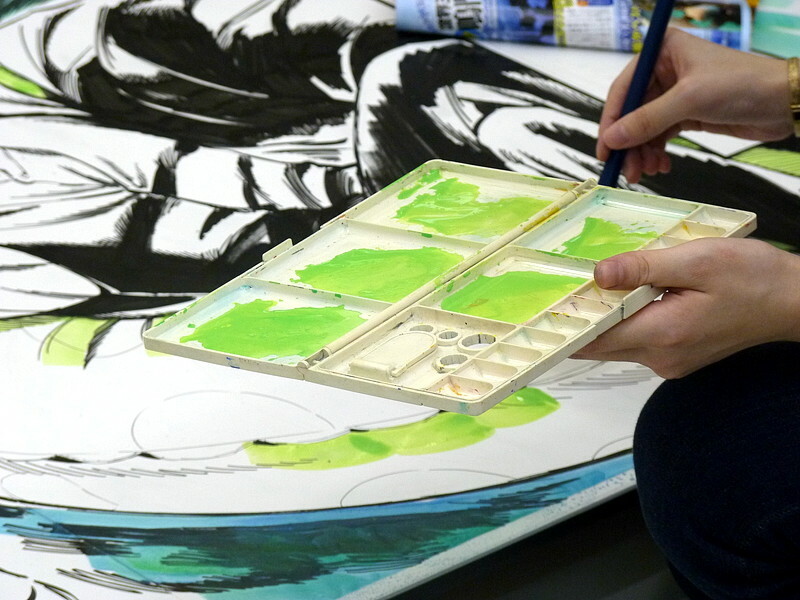 Koji Miyata colouring his part. 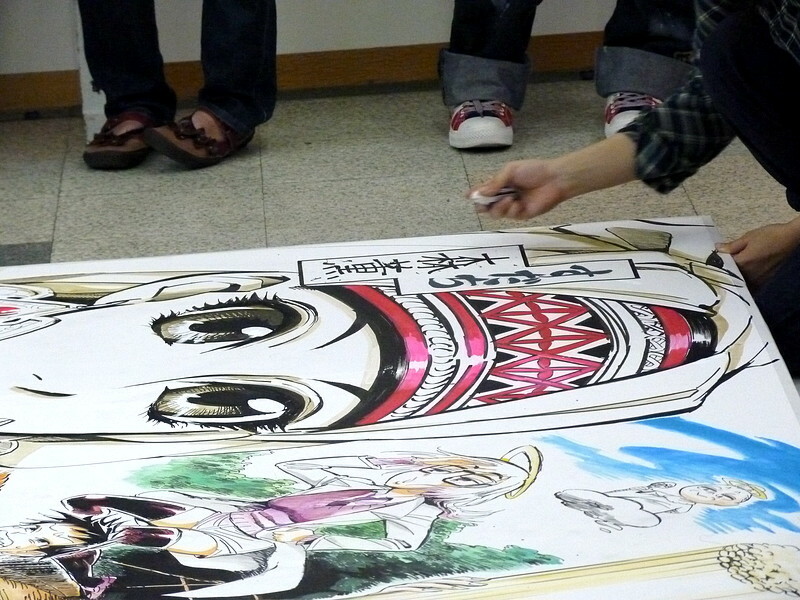 Aki Irie paints a girl dancing Awa Odori. 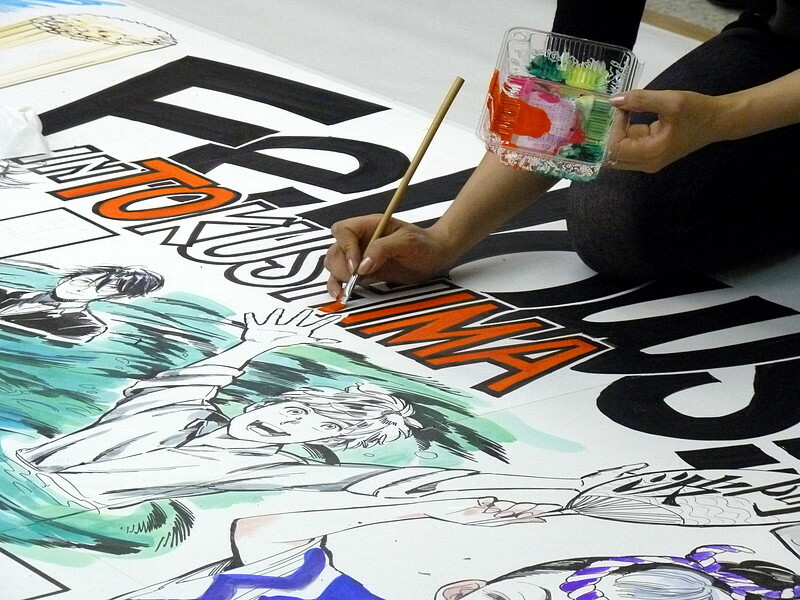 The following video shows Natsuko Takahashi painting the sea and Aki Irie painting the girl's Happi coat. 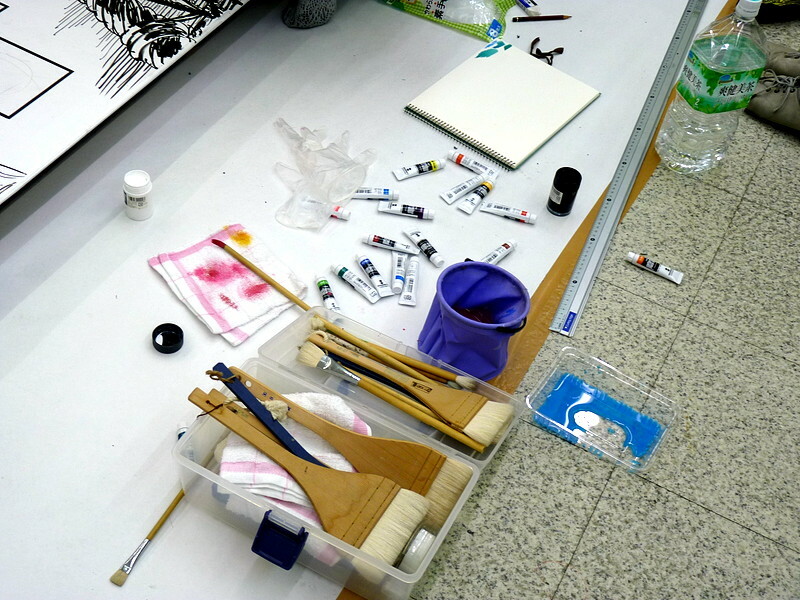 Natsuko Takahashi's palette whilst she paints the float. 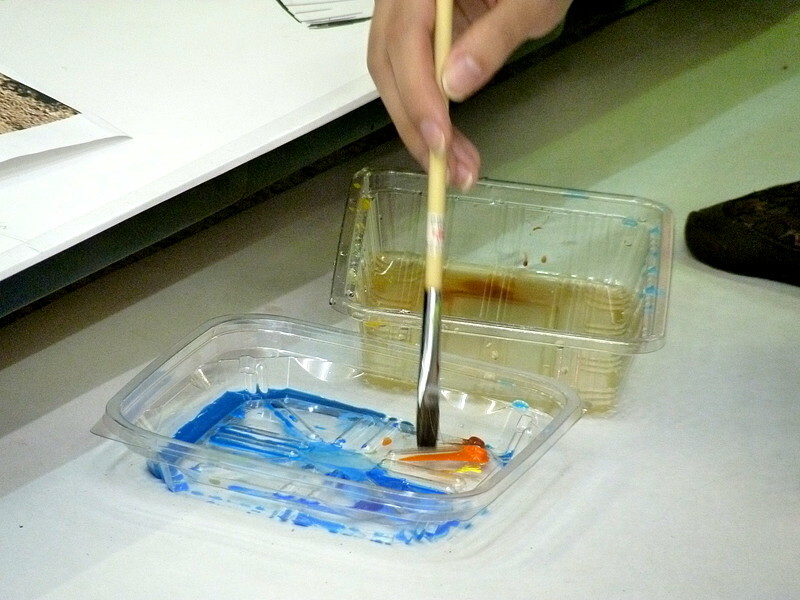 While colouring sea water, she used these plastic trays. 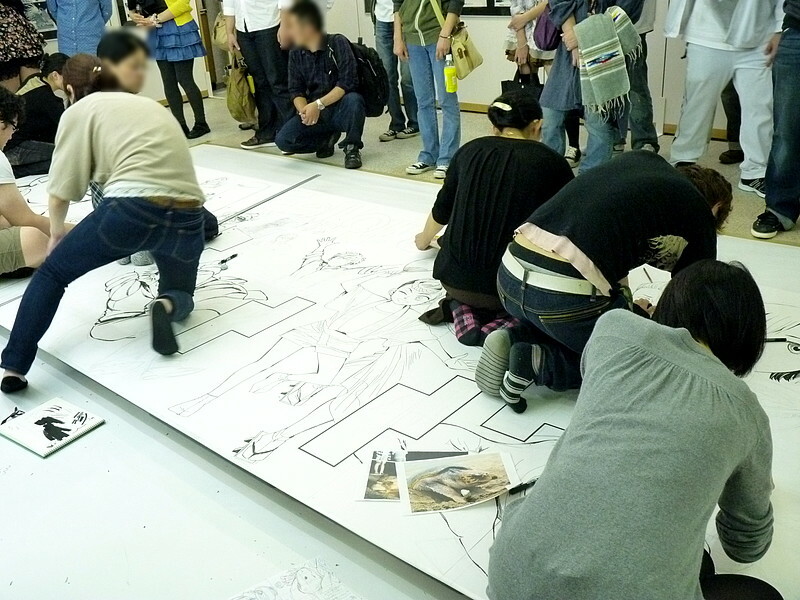 Michiyo Nii colouring in a woman's dress. 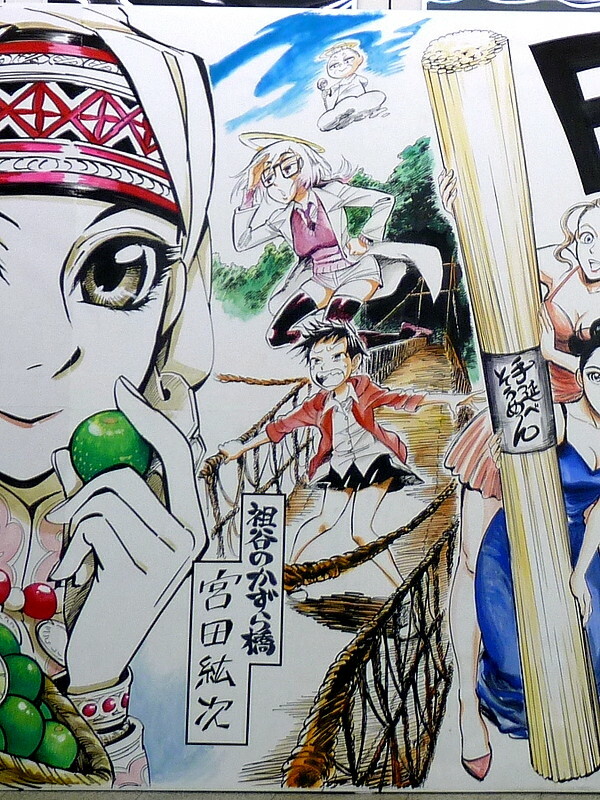 Kaoru Mori paints the sudachi fruits switching between two brushes. 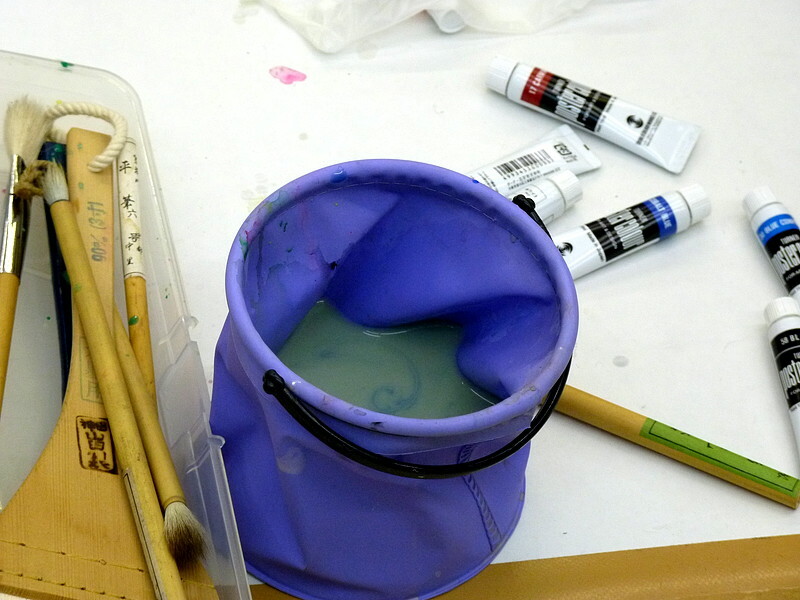 Here she colours Amira's earring. 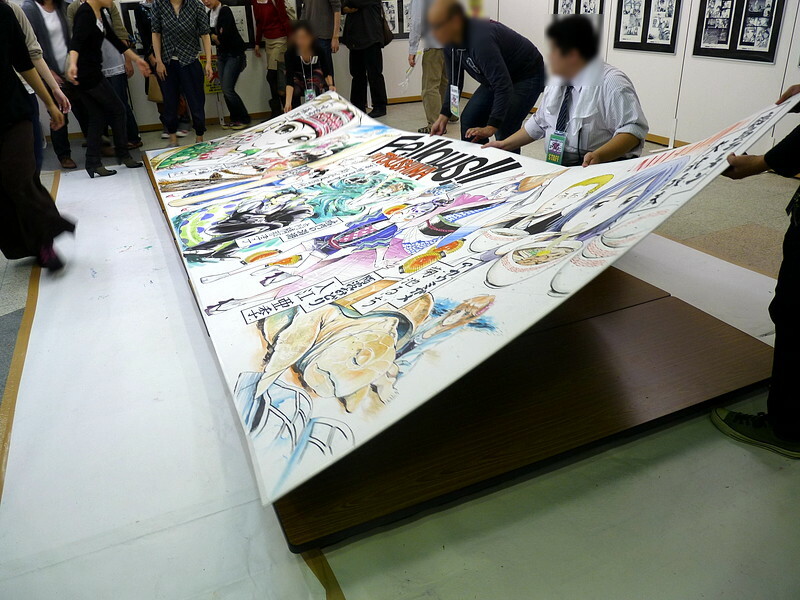 Apperently a manga artist must be sure-footed as well as sure-handed. 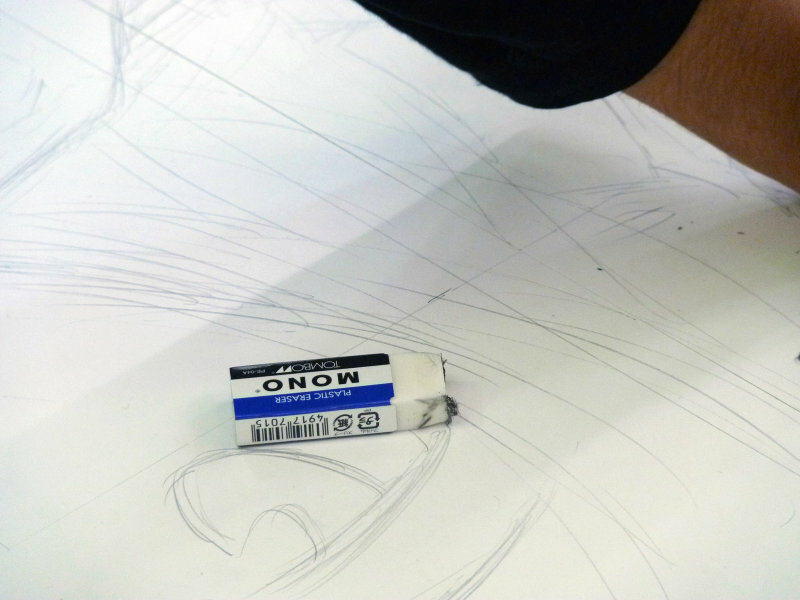 Michiyo Nii colouring a crucial part. 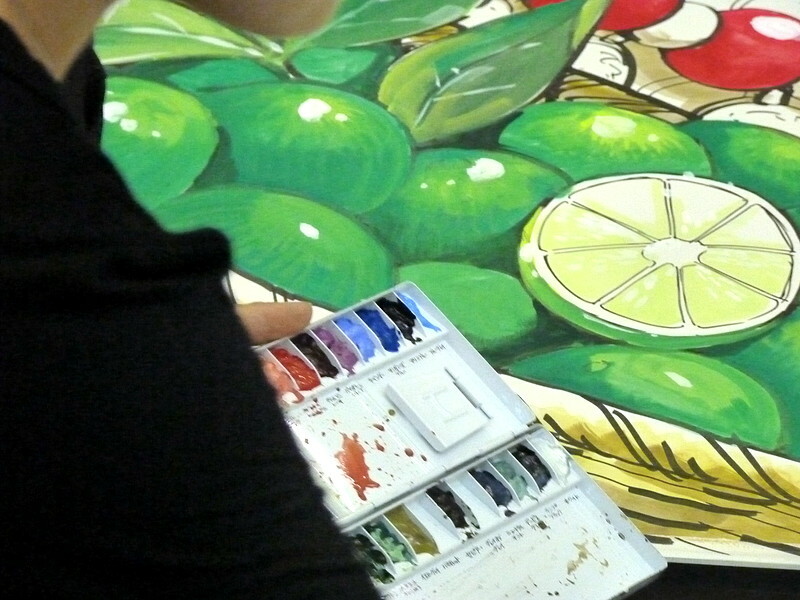 The colour brings life to her. 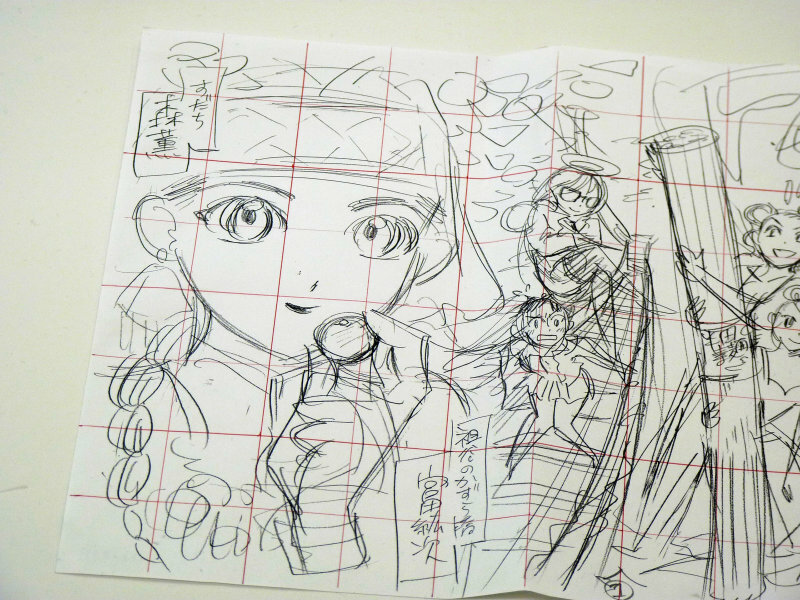 Aki Irie adds patterns on the girl's happi coat. 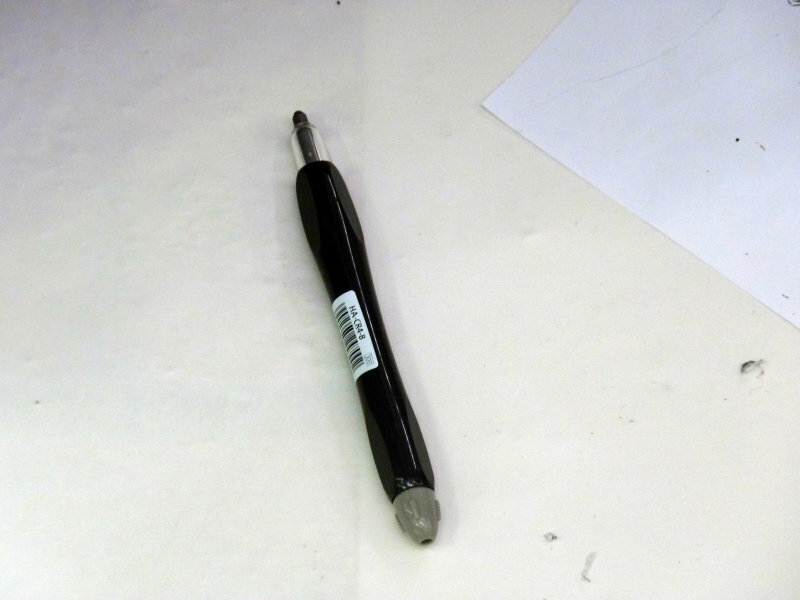 Then she outlines the letters on her lapel using Zebra Mckee marker. 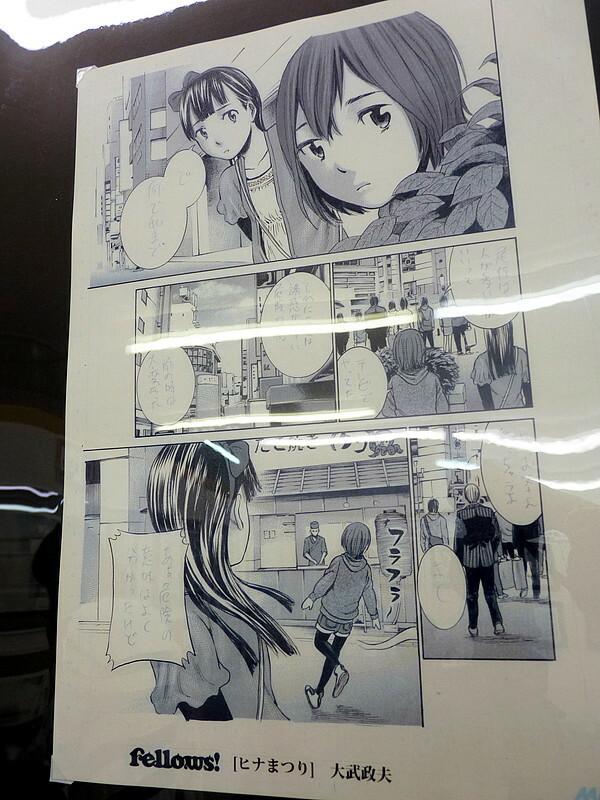 Kaoru Mori also touches up the outline and shadows. 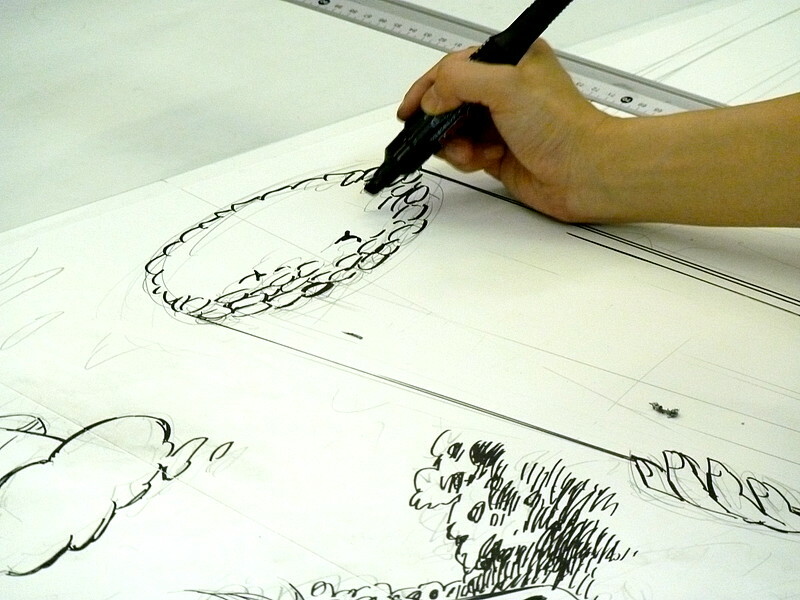 Kaoru Mori writing her name. 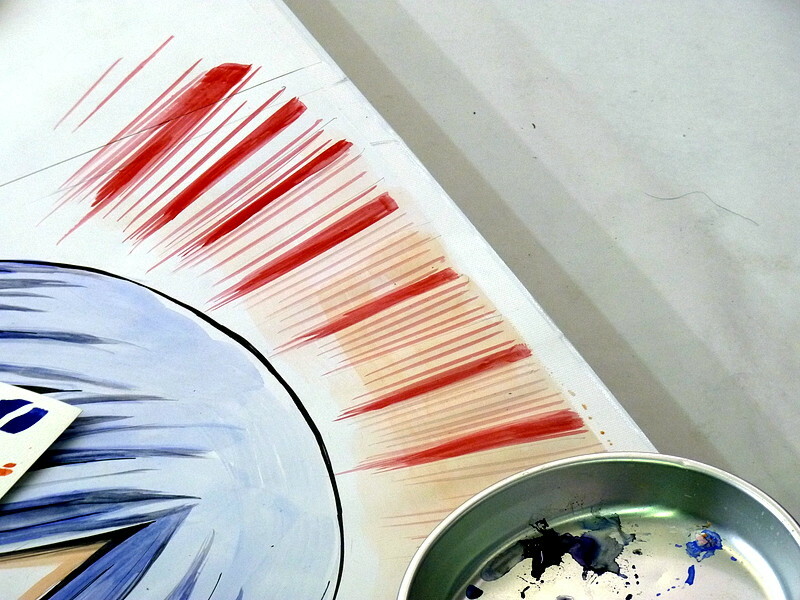 Natsuko Takahashi, whose theme was Naruto whirlpools, drips some white poster colour to get the shiny, splashy effect. 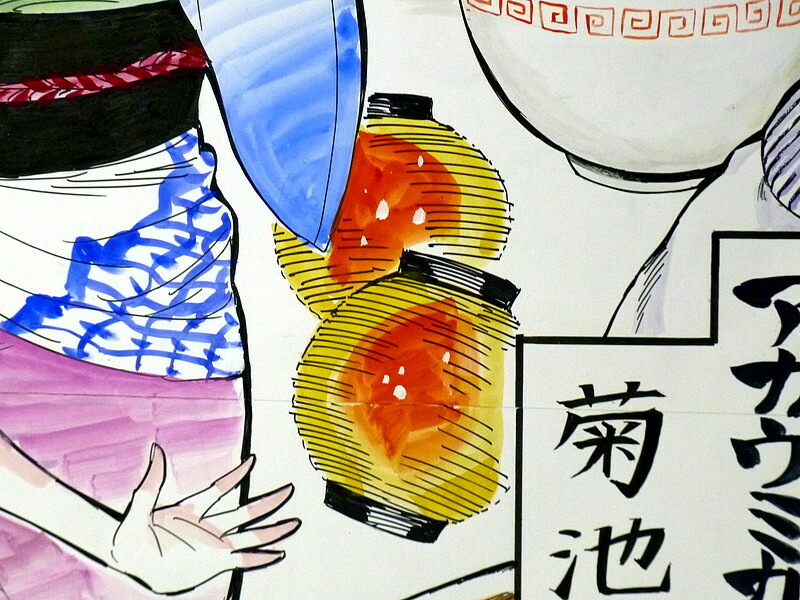 Aki Irie swiftly adds in some chochin lamps while Ruchi Kikuchi does some lettering on her name. Here's how the chochin came out. 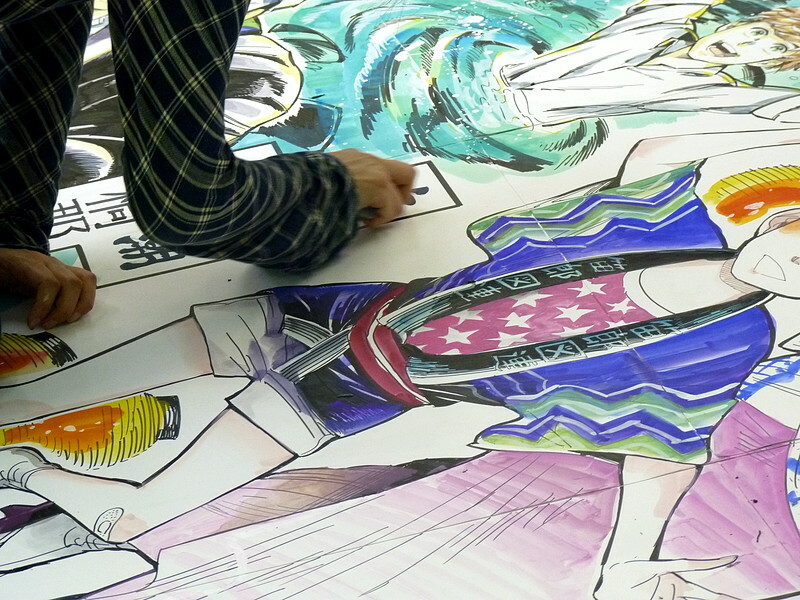 Michiyo Nii lends a hand colouring Koji Miyata's illustration. 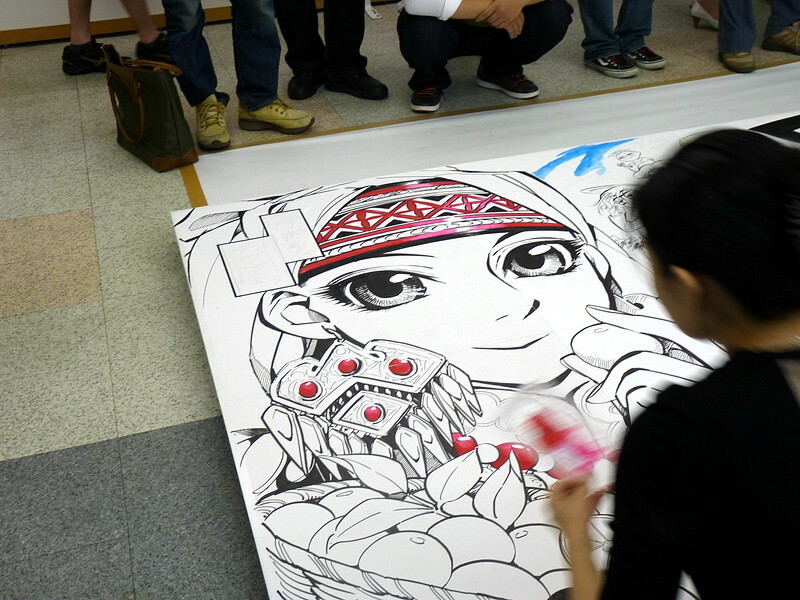 Nearing completion, Michiyo Nii inspects each part with an eraser in hand. 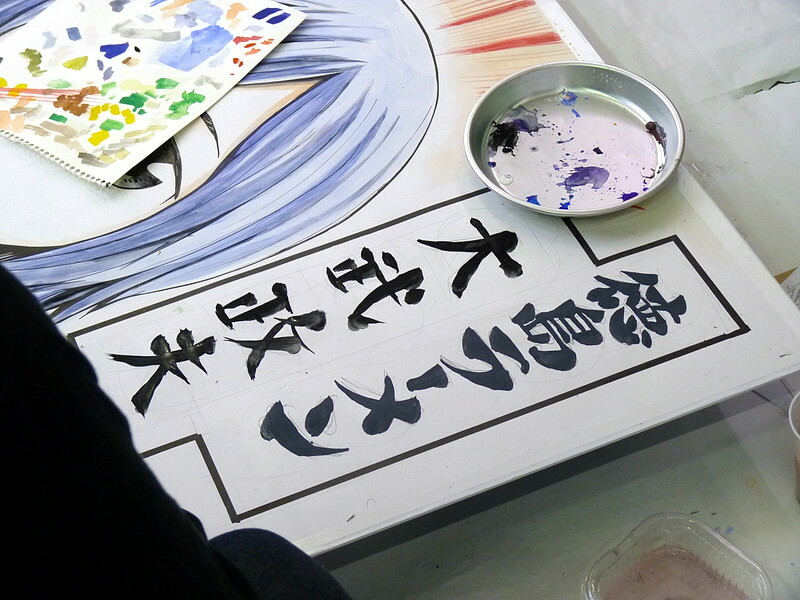 Masao Otake attempts to draw "shuchusen"(lit. 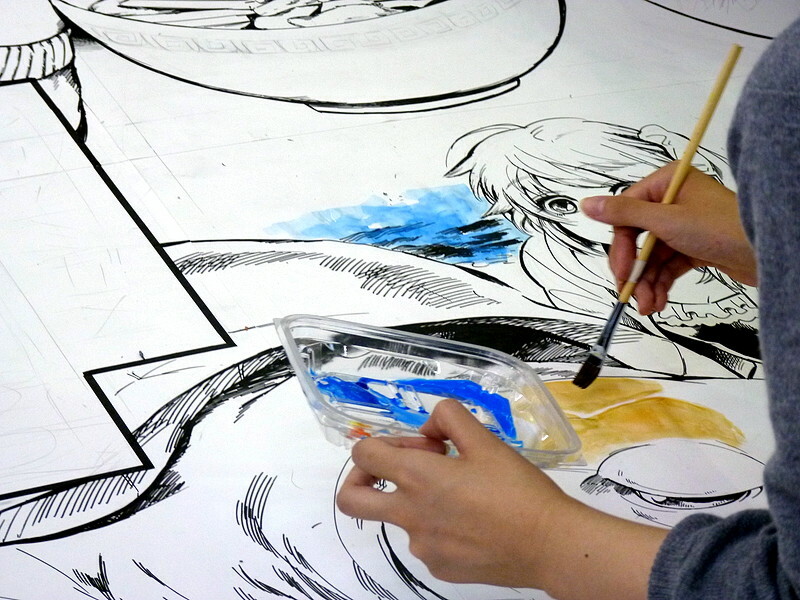 concentrated lines) with a paintbrush, a technique frequently used in manga but usually done with pen. Looked tricky at first but here's how it came out. Quite a feat. 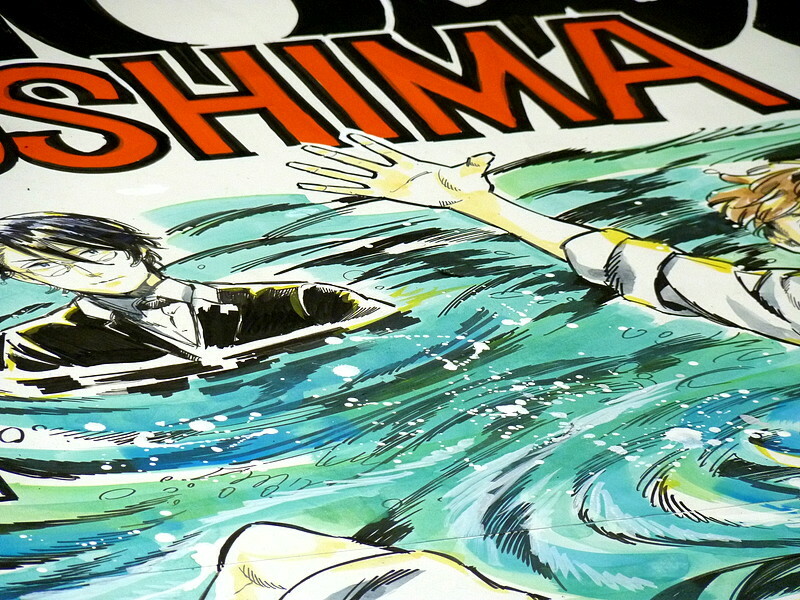 Otake signed his name at last. 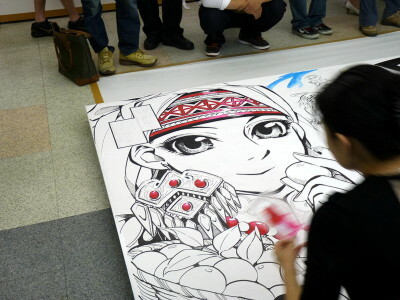 Michiyo Nii from Tokushima, who orchestrated the whole painting, checks the details for one last time. 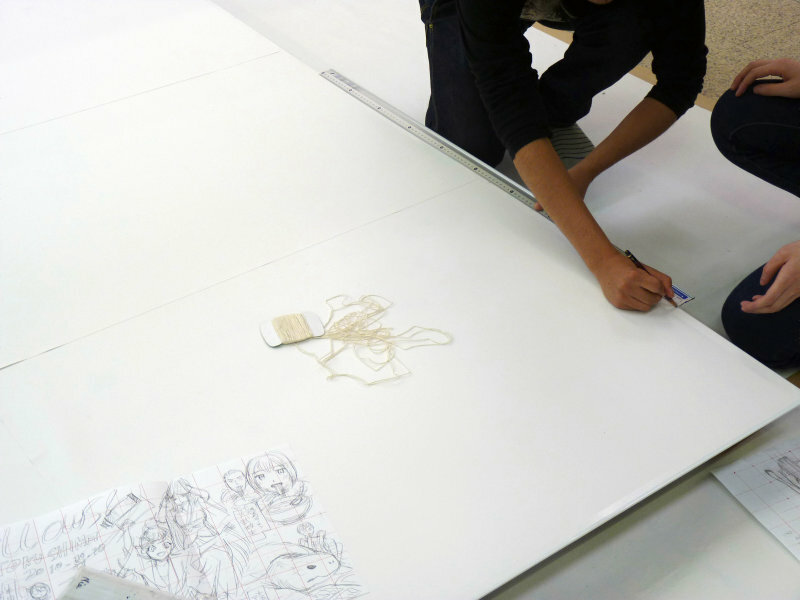 Lifting the board, brushing off eraser dust and whatnot. 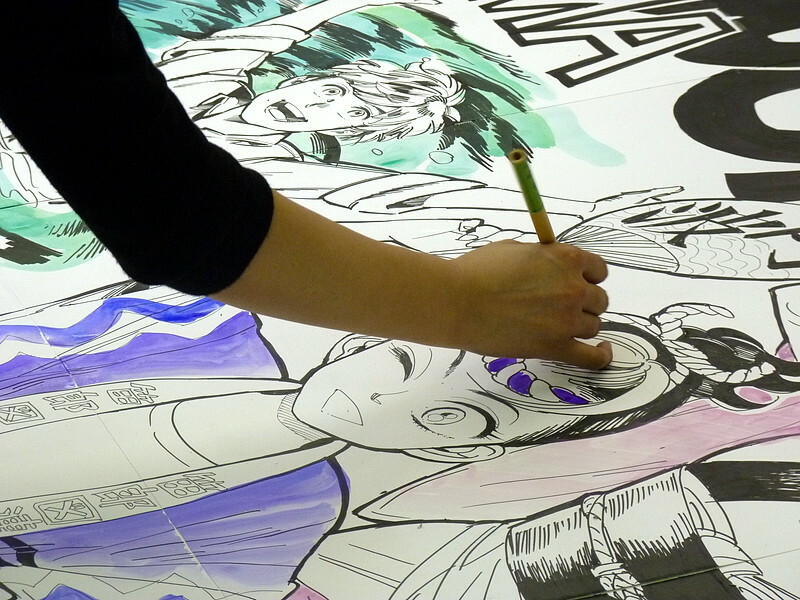 The gallery erupted into applause when the mural was finally finished around 8 pm after eight hours of collaborative efforts. 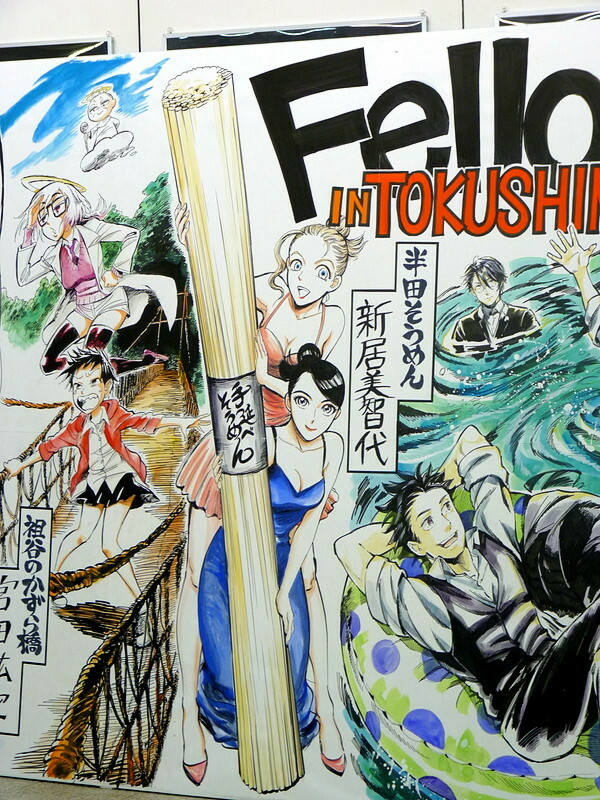 Here are some close-ups of the Tokushima-themed illustration done by each artist. 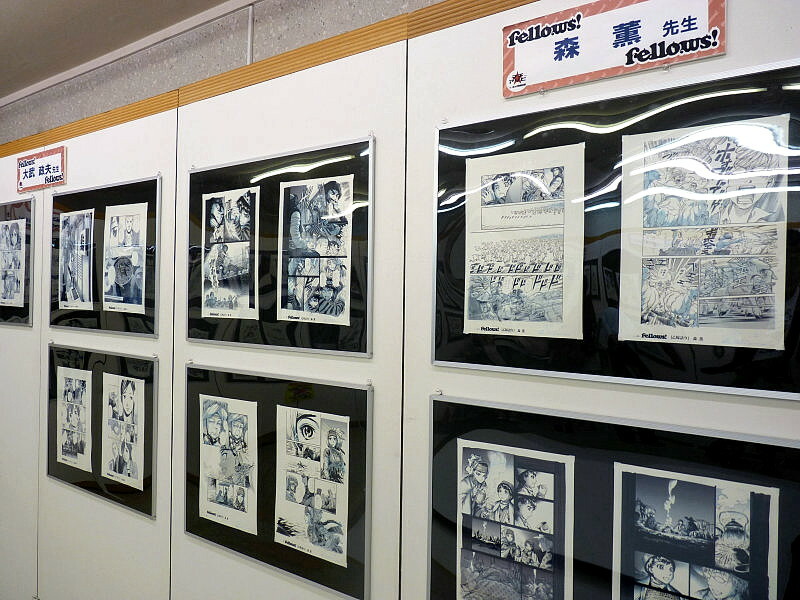 Kazurabashi (a famous ancient suspension bridge in Miyoshi, Tokushima) by Koji Miyata. 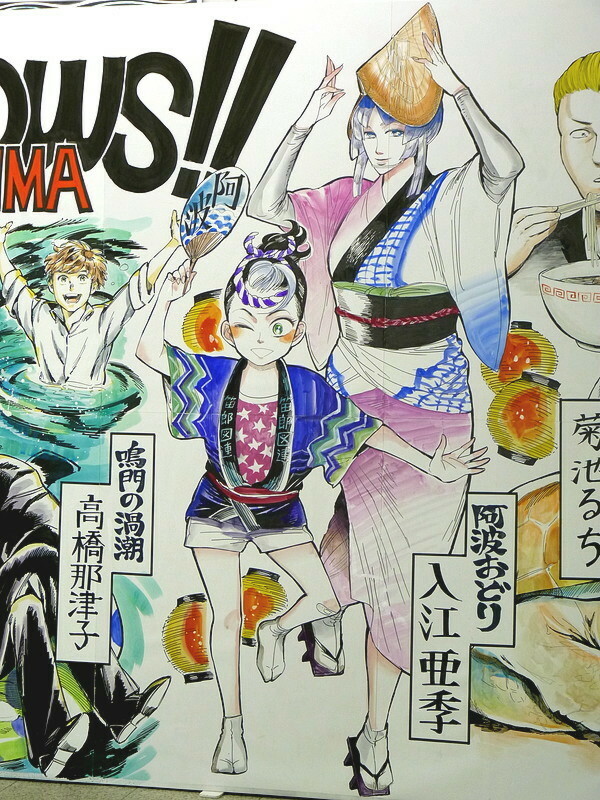 Handa Somen by Michiyo Nii. 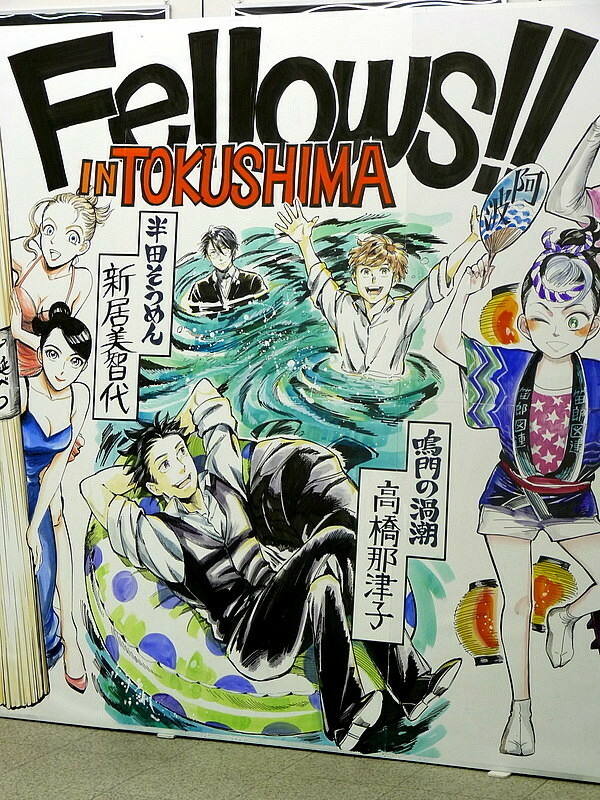 Naruto whirlpools by Natsuko Takahashi. 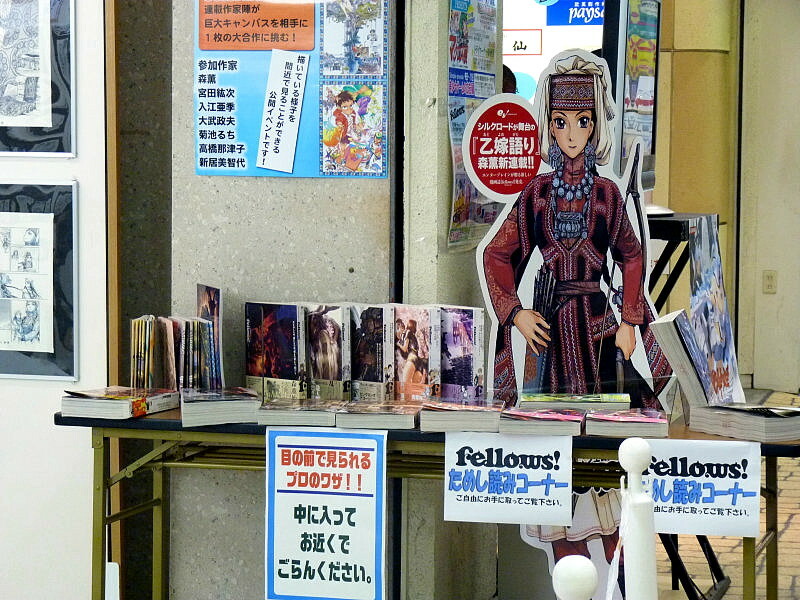 Awa Dance Festival by Aki Irie. 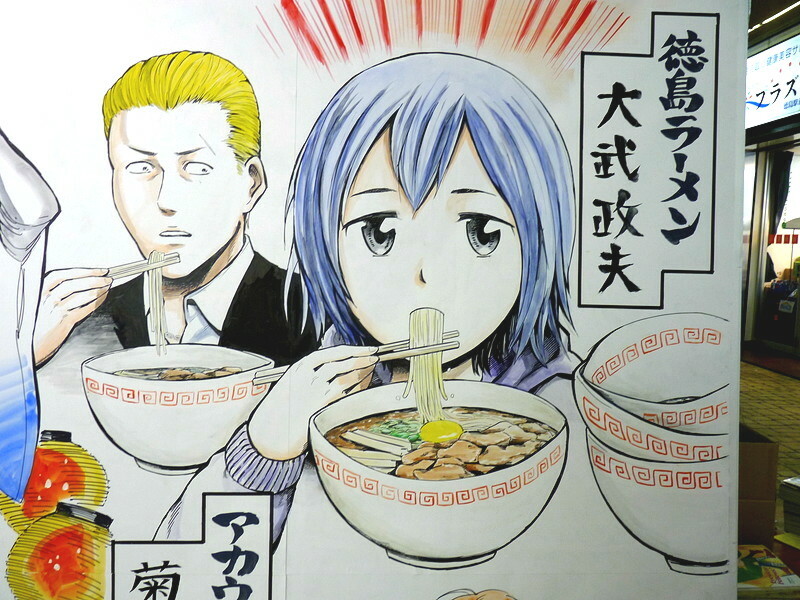 Tokushima Ramen by Masao Otake. Loggerhead sea turtle by Ruchi Kikuchi. 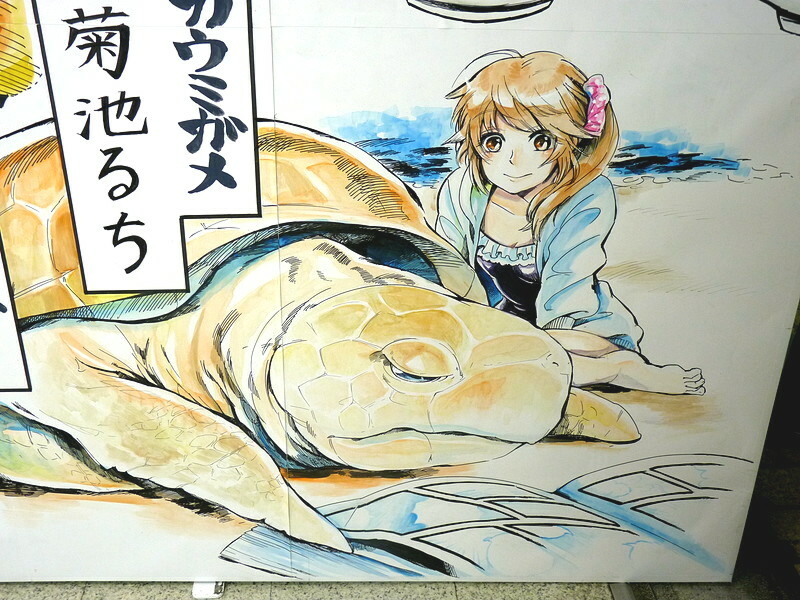 The endangered species is known to lay eggs on Ohama Beach in Minami, Tokushima. 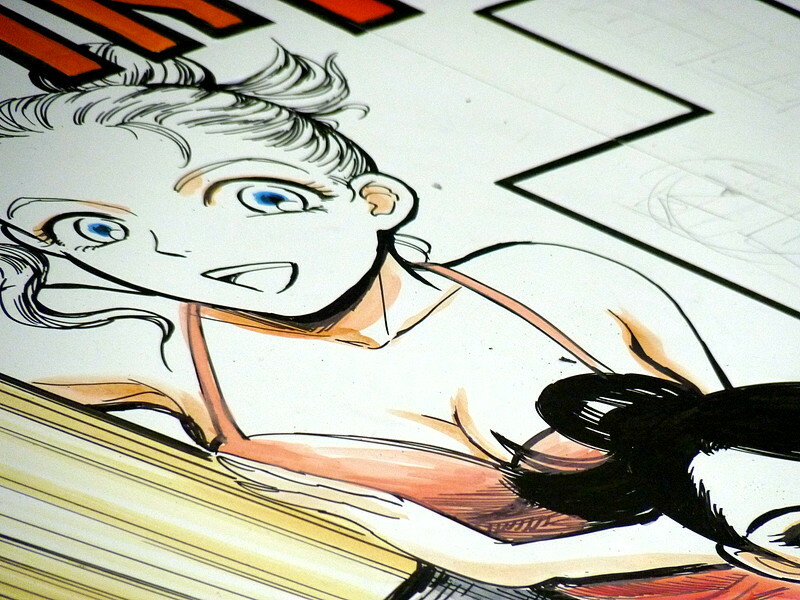 Here's what the whole picture looks like. 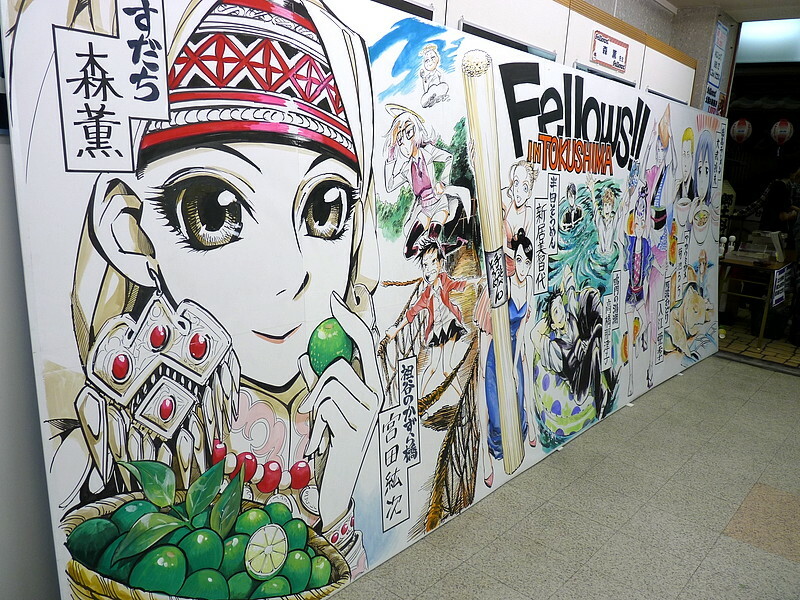 The painting will be hung on the wall of Nankai Books, a manga-centric bookseller in Tokushima.